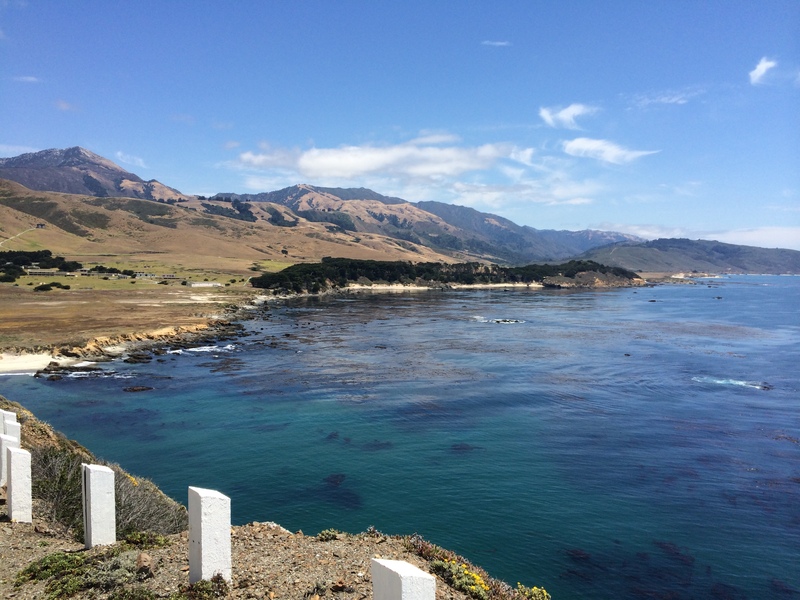 If you google (that is an official dictionary word now, sorry Yahoo and Bing) “best road trips”, you will be hard pressed to find a list that does not include the California Coast. The Pacific Coast Highway (aka Highway 1, aka the PCH) is a must for everyone’s bucket list and a once-in-a-lifetime trip! 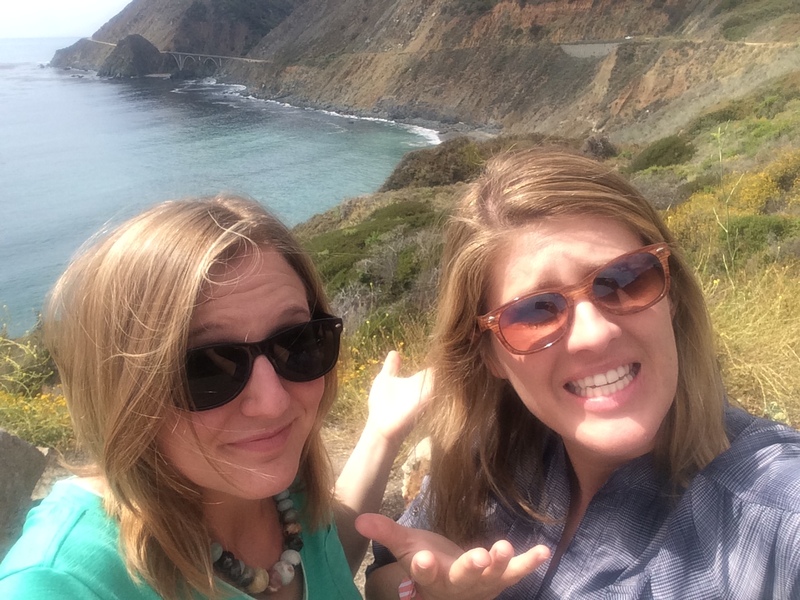 Literally it is probably a once-in-a-lifetime trip because the scenery might be some of the most breathtaking and gorgeous landscapes I will ever see, but the winding PCH is a slow, car-sick inducing, sometimes scary drive. But let’s not focus on the ONE negative here otherwise I would be doing a crappy job of convincing you all to take this amazing road trip. I mean you can’t get to the incredible Machu Picchu without traveling on rough roads or hiking strenuous trails to reach that far off the beaten path site! 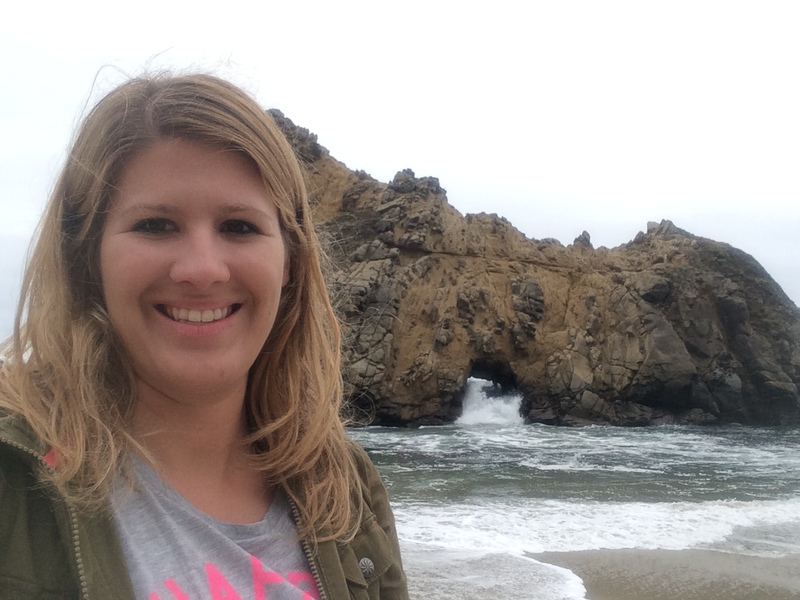 I have actually driven the PCH twice in my life now, so it’s been more than once-in-a-lifetime for me! [I’m an over-achiever like that.] The first time was on my drive to San Francisco in 2011. 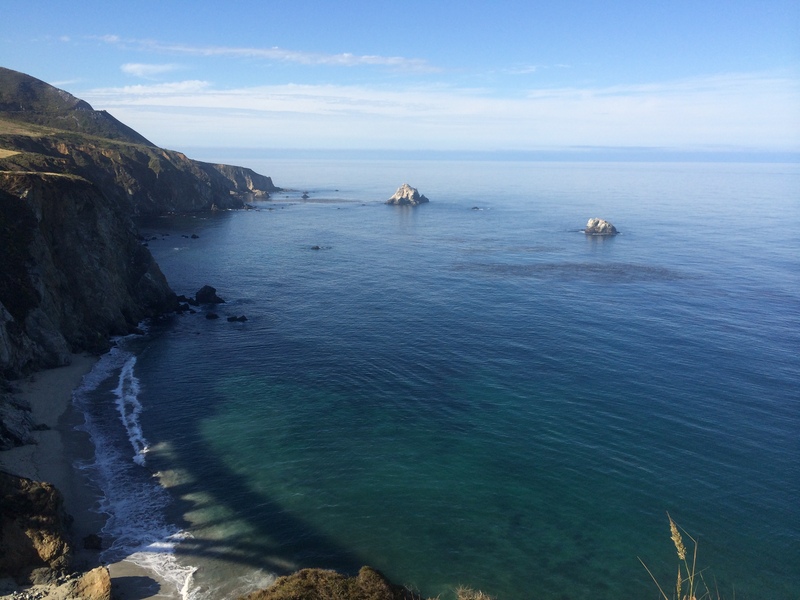 The California Coast is truly an exhilarating drive that offers constant breathtaking views. Make sure your camera has lots of memory space for all the gorgeous vistas! 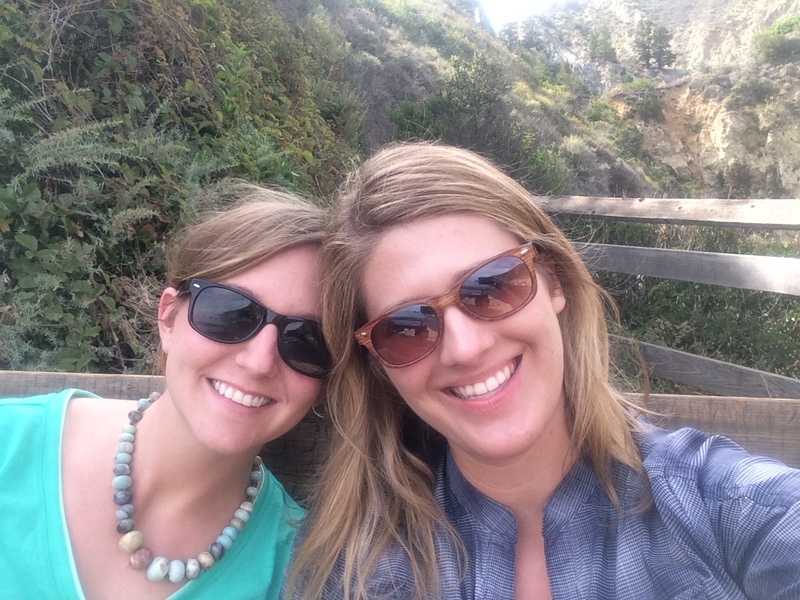 My friend Hillary (and co-host of my other travel blog) and I wanted to explore central coastal California, specifically Big Sur, and we set out for a four day adventure we titled our “Classic California Road Trip”! We began our road trip by not driving and hanging in Los Angeles. 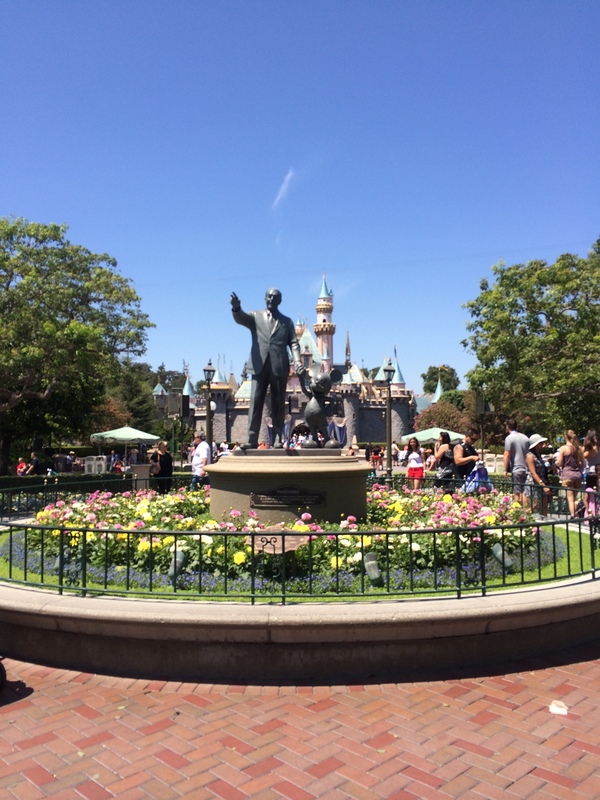 On Thursday we spent the day at Disneyland and it was as expected: awesome! 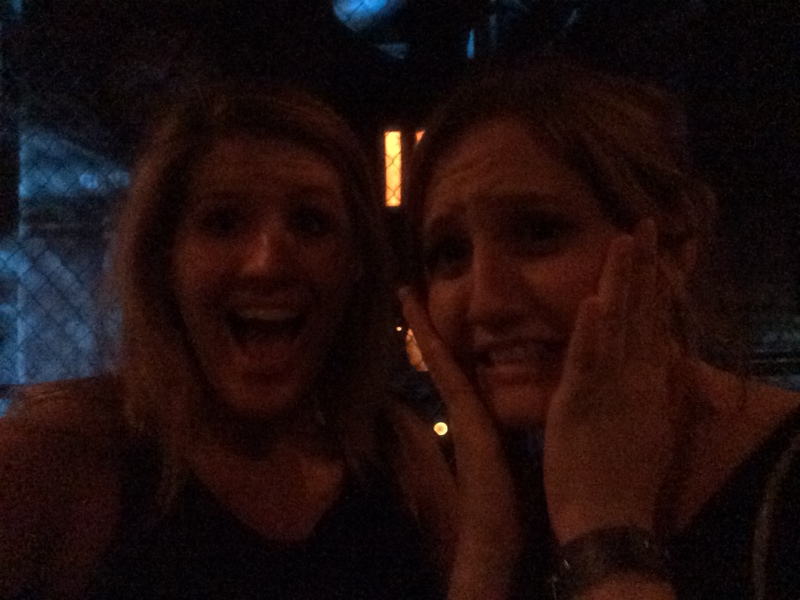 I rode my favorite ride The Tower of Terror and we watched the Wonderful World of Color show. It was a great day! This wouldn’t be a classic California trip without a trip to Disneyland! Mr. Disney is a fellow Missourian like me! 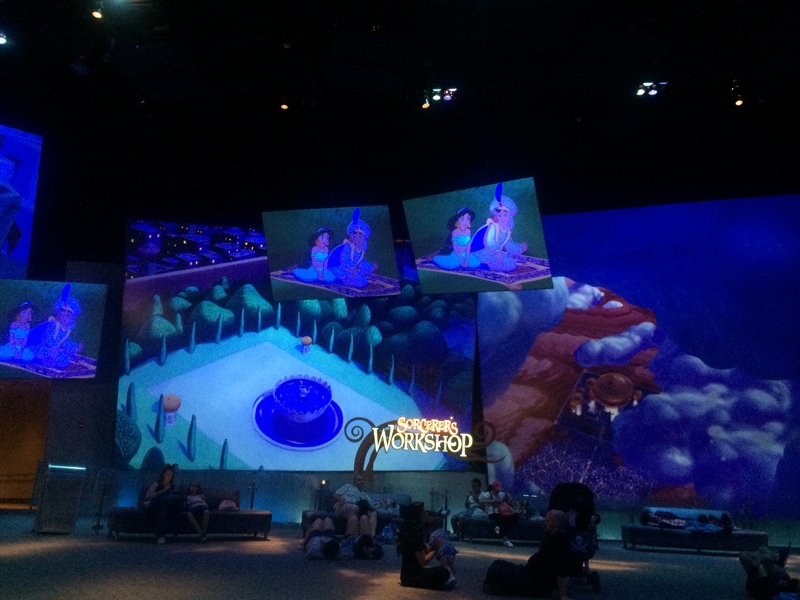 The beautiful quiet room where we rested and watched the art of Disney’s animated films. 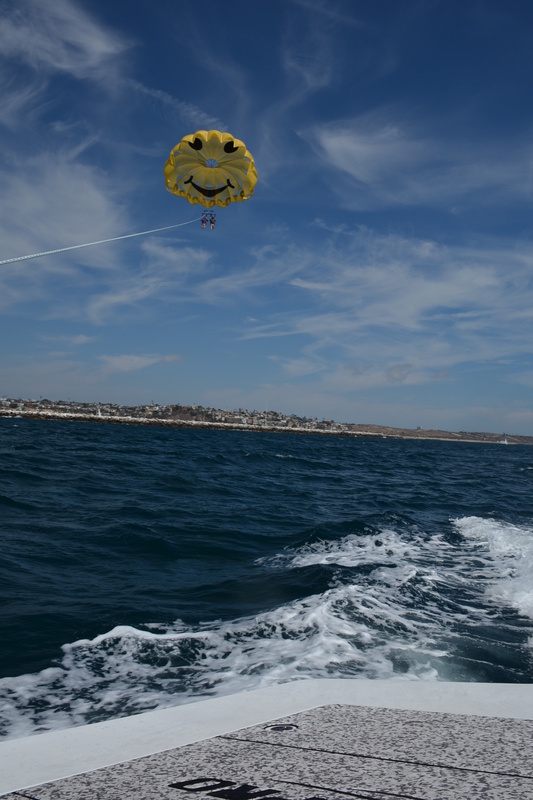 Then on Friday we went paddleboarding and parasailing! (Only P titled activities were allowed on Friday so we did not try surfing that day.) 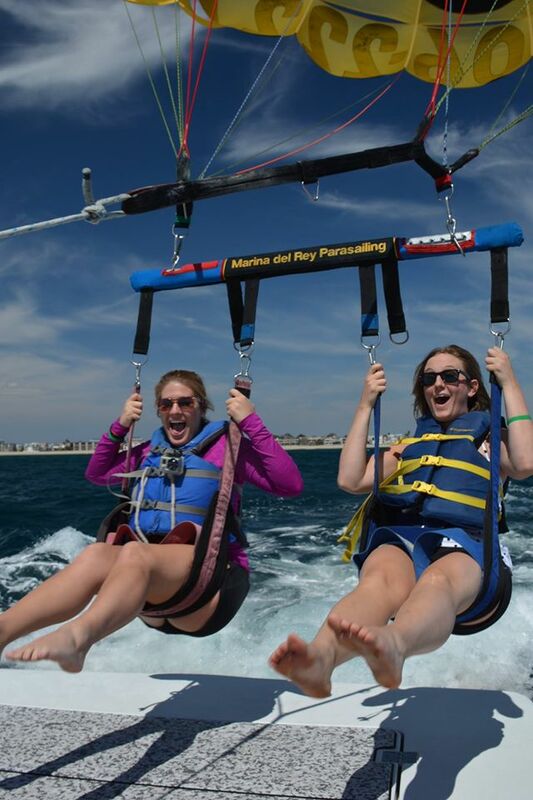 Parasailing was a bucket list item (one of many we accomplished on this trip actually!) for the both of us and an thrilling activity I highly recommend. 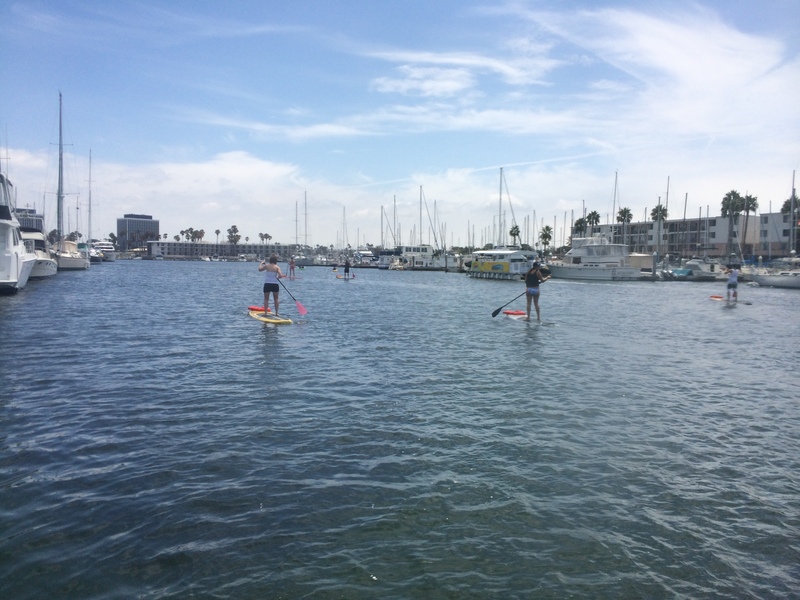 But first up was stand up paddleboarding in Marina del Rey at Marina Paddle. Our instructor was great and stayed with our group for the full two hours on the water. He wasted no time in getting us into the marina stating that we learn best by doing. 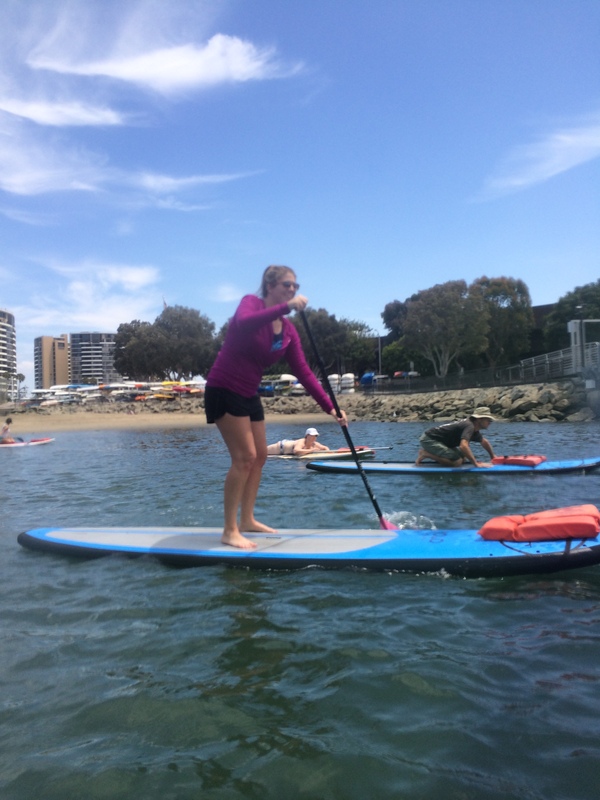 So after a quick tutorial on the docks about how to paddle, steer and stop we were out in the water and paddling like we did this everyday. It was such a fun and peaceful activity, and also a great workout. 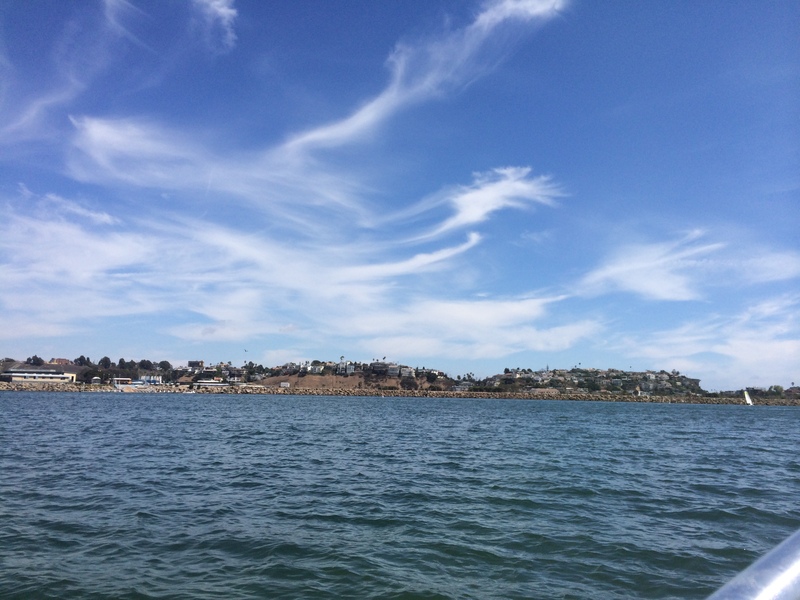 Especially since we paddled for the full two hours…I was afraid I wouldn’t have the strength to make it back to the marina where we started. Boy, my arms and legs were so sore afterwards! Though probably not as sore as our guide who had to paddle back to the marina with his arms only because one of the people in our group managed to break the not-easily-breakable paddles right at the base of the paddle and pole making it impossible to use. Our guide was actually impressed by this feat lol. 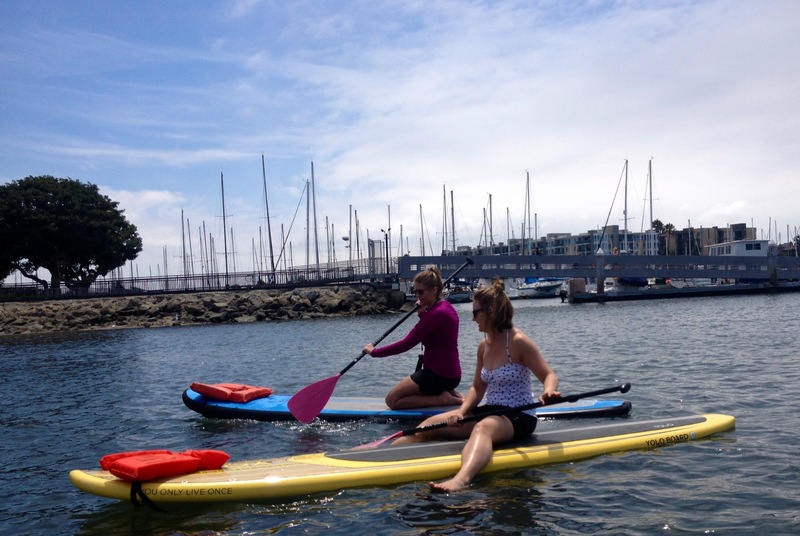 Paddling away from the shore and back out to the marina! Hillary’s first time paddle boarding and she’s a pro! 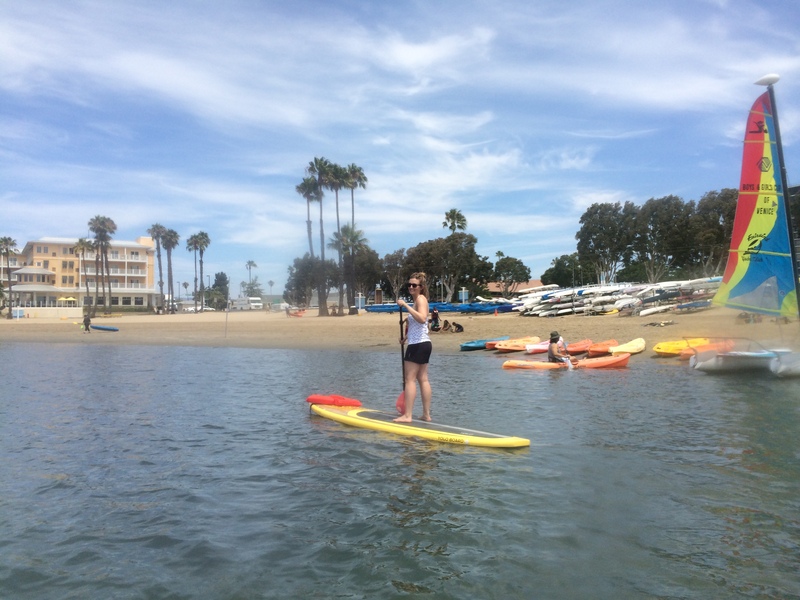 An important tip to note for paddle boarding, especially if you are new like me, is to keep looking out at the horizon. If you look around too much (and try to take pictures and film) then you will fall in the water! Thankfully the water has been warmer this summer in SoCal so it felt refreshing. But it totally ruined my hair for the rest of the day! Just the worst. 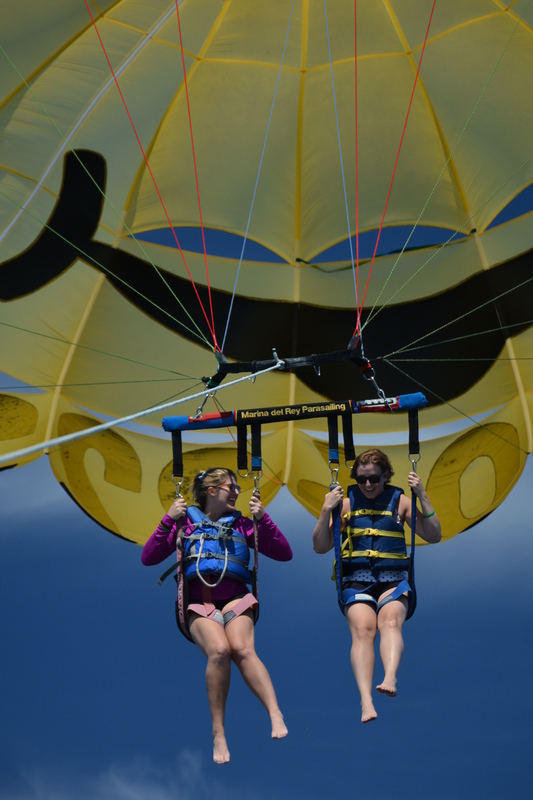 Since stand up paddle boarding was not enough ocean activity for one day, our next adventure was parasailing! 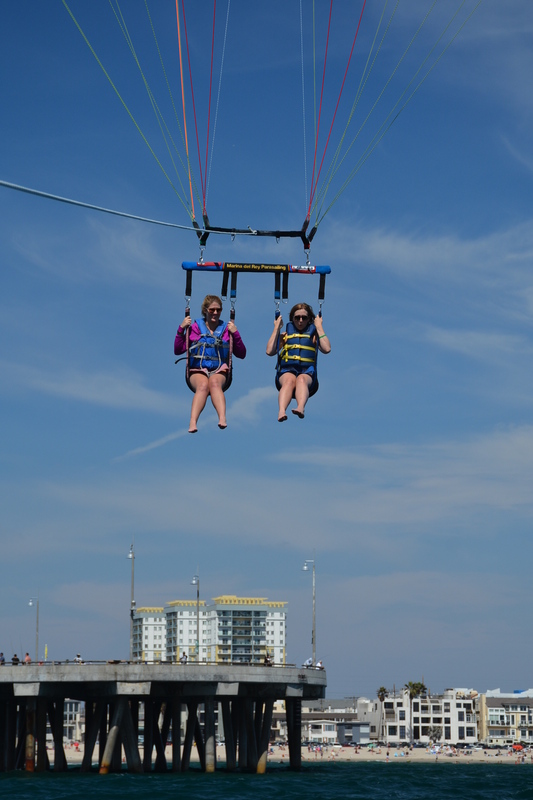 I’ve wanted to go parasailing for a very long time and I was finally doing it! 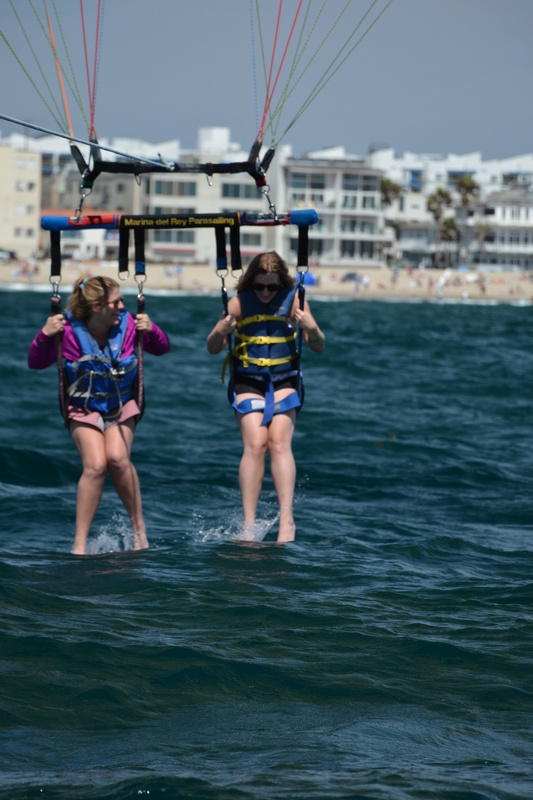 I highly recommend Marina Del Rey Parasailing for parasailing in Southern California. Their crew is awesome and we had a lot of fun. 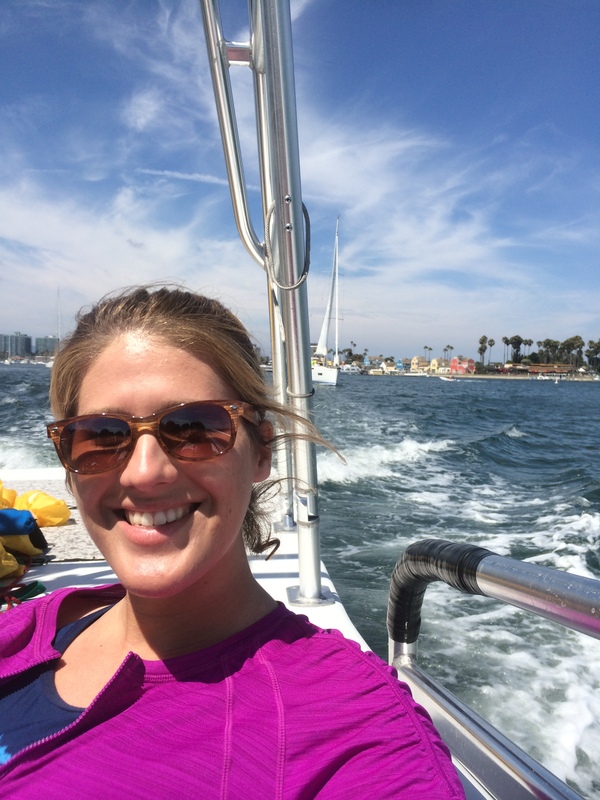 We jammed to Caribbean music while cruising the ocean and enjoyed being out on the water. Also we might have seen David Hasselhoff driving his boat into the marina as we were leaving…I’m still not sure if our captain was joking or not, but it sure looked like Mr. Hasselhoff! Our Captain taking us out of the marina and into the ocean! After about a 10 minute boat ride out into the Pacific Ocean, we were geared up to take off. The anticipation sitting on the back of the boat waiting to be pulled up felt like waiting on the top of a roller coaster right before it goes downhill. It was exhilirating and awesome! It you have a fear of heights this is probably not the activity for you, but I loved every minute! It felt so freeing and amazing to be so high up in the air with the ocean below and the sights of the coast and mountains was beautiful. Aside from both Hillary and I getting sea sick (I’ve always had to deal with sea sickness but was hoping I out grew it…p.s. I have not…p.s.s. 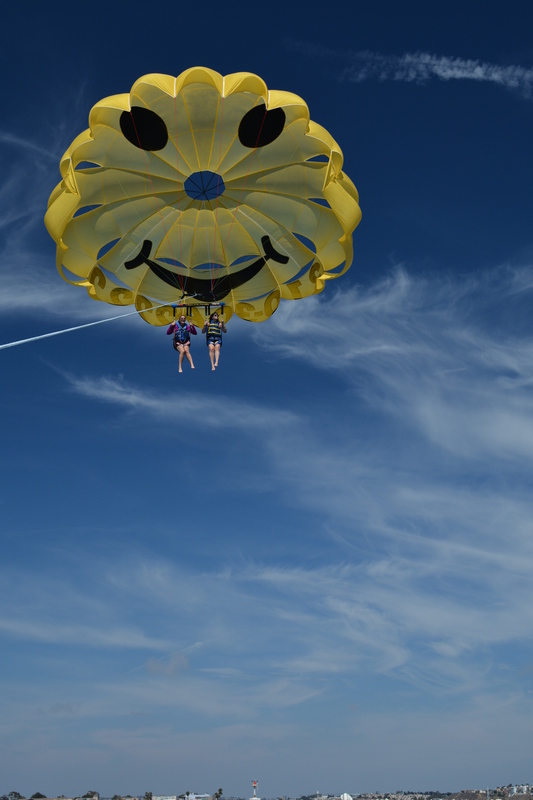 the truffle mac n’ cheese for lunch probably didn’t help), parasailing was one of the coolest things I’ve ever done. We were the first in our group to go which I am thankful for since I got progressively sea sick on the boat. And going first also meant way less time we had to wear the bulky life jackets while waiting for our turn. Win! Amazing views of Los Angeles and the California coast! It was exhilarating to be so high up! Our captain asked if we wanted to be dipped in the water when he was reeling us back in and we said “why not!”. Since we went first we had no reference for what that meant and assumed it meant dipping our whole bodies in the water. Wrong. Just the feet. But we screamed like little girls as we approached the water thinking we were going all in. We were embarrassed when we realized it was just our feet. Yep we are those girls that totally overreacted to only have their feet dipped in the ocean. Oh wells. After parasailing we drove back to my apartment to pack up the car and then began our drive to Santa Barbara for the night. We spent Friday night at a friend’s place there to shorten our drive the next morning. 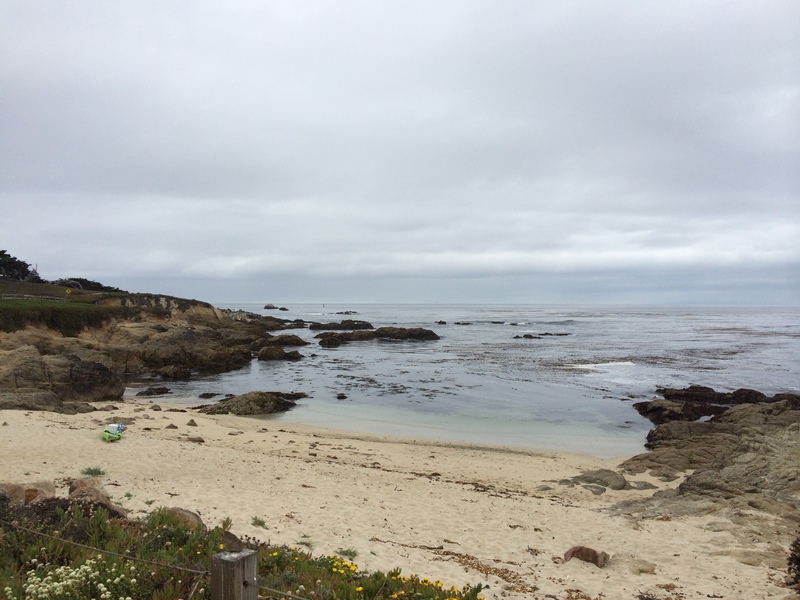 We left pretty early on Saturday morning since we still had five hours until we would reach our accommodations in Carmel (note I am not saying hotel…more on that story later), but not before stopping for coffee first! 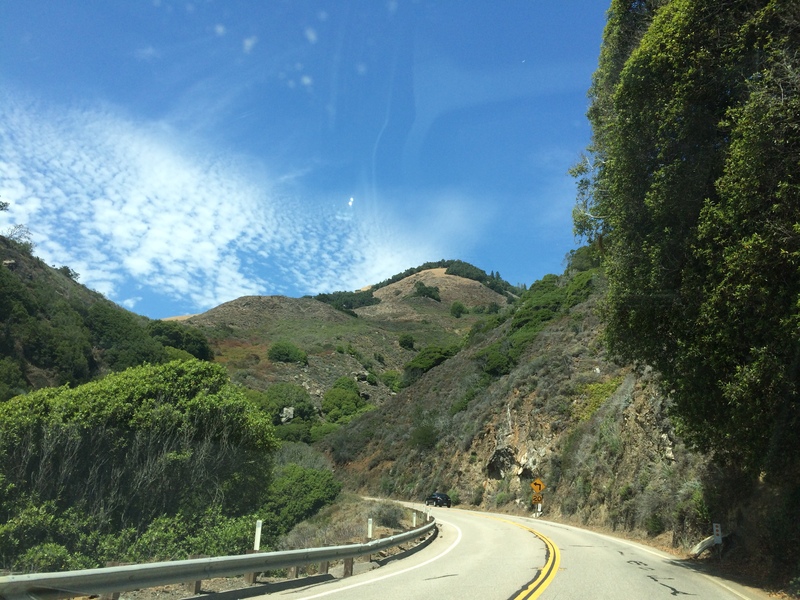 After our caffeine fix we officially began our road trip to Big Sur! 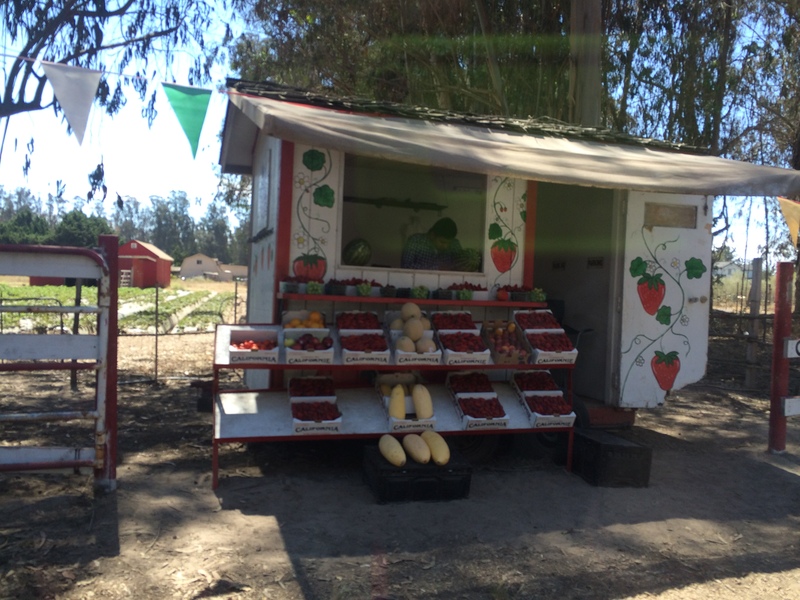 Somewhere along the winding roads through the mountains we stopped at a stand and bought strawberries. I immediately wanted to eat them, but meanie (and also smart) Hillary made me wait until we could wash them. I like to live life more on the edge haha. The local vendor along the highway where we bought our strawberries! The first big town we hit since leaving Santa Barbara was Pismo Beach. 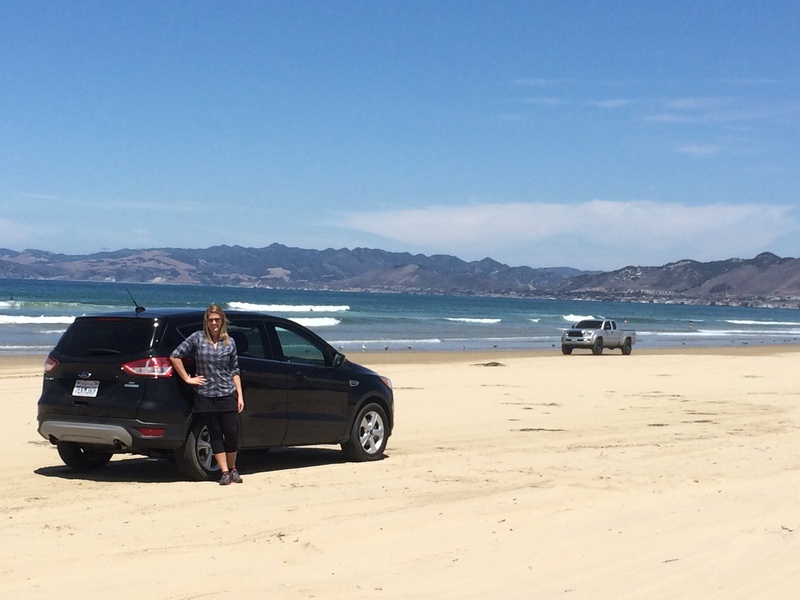 As we drove through town admiring Pismo’s funky style we noticed that you can drive on the beach here, so of course we had to do that! For a mere $5 all day access we drove on the beach with the ocean on one side and the sand dunes on the other side. 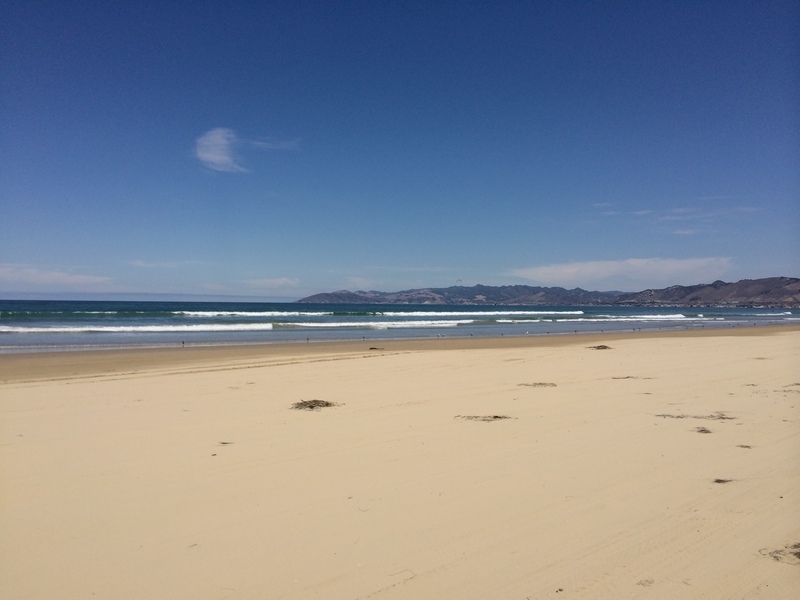 Pismo Beach might be most famous for its sand dunes and you can rent ATVs to drive on the dunes. I want to do that someday! 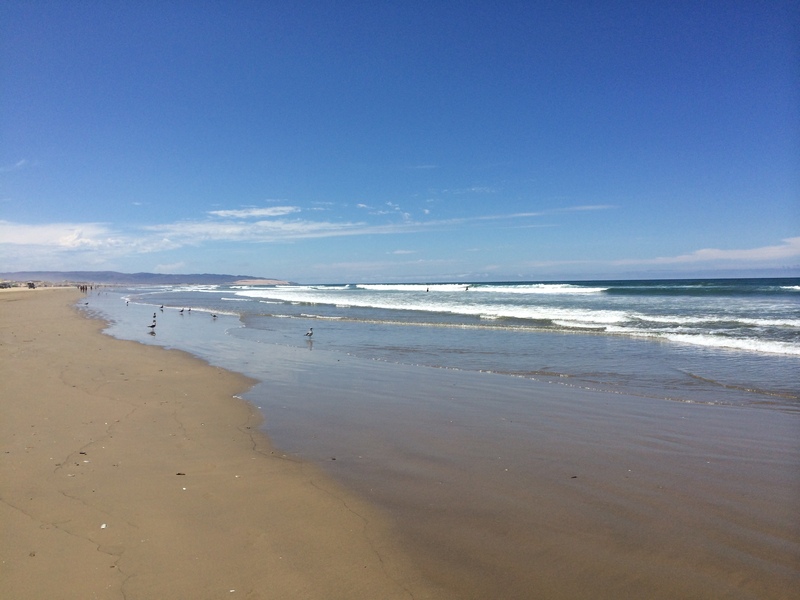 Enjoying the summer sun and cool ocean breezes of California! 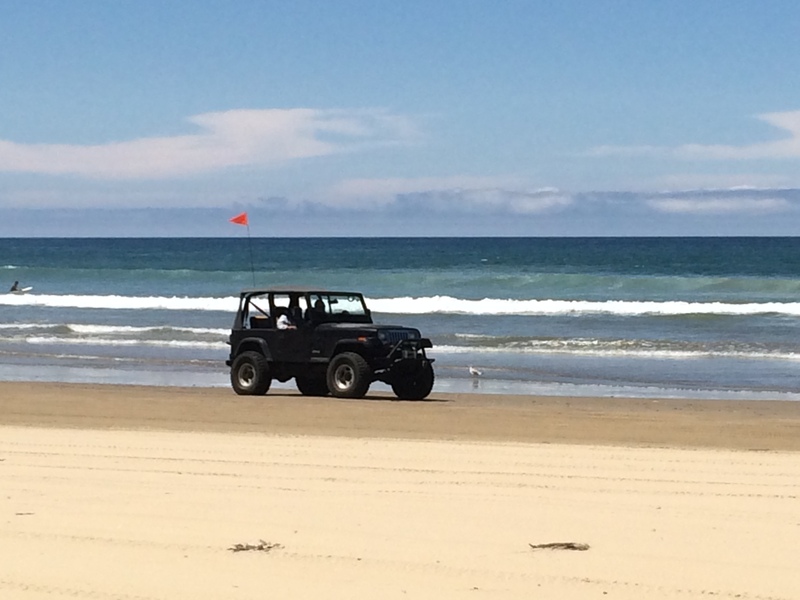 I would love to drive a Jeep on the coast someday! 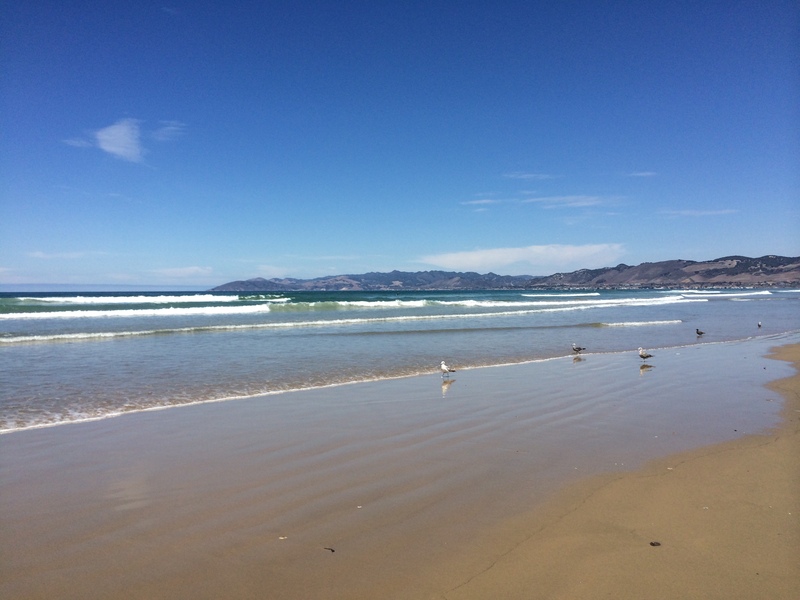 Pismo Beach is your classic California surfing town! A beautiful day on the wide stretch of beach! 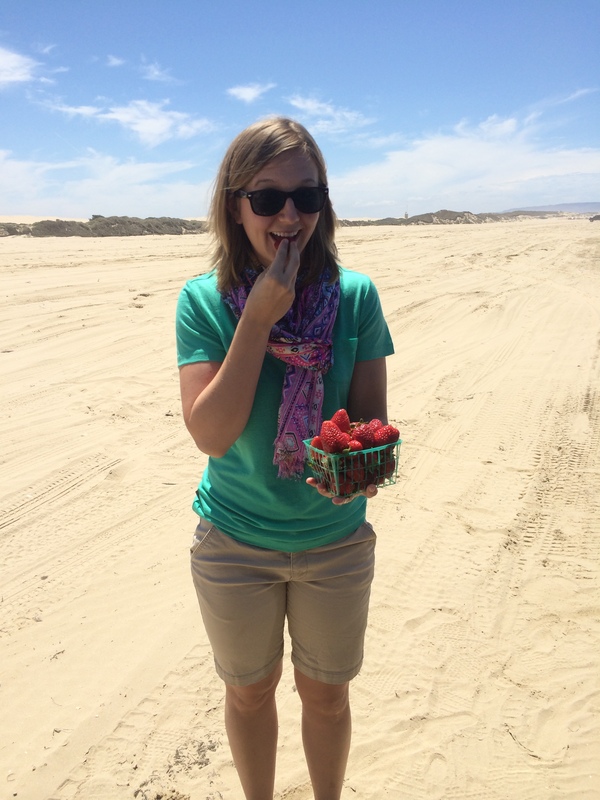 Enjoying our local bought strawberries! Unfortunately we ran out of time (and money) but near Pismo Beach is a very cool site I want to explore. The Guadalupe-Nipomo Dunes hold a secret to Hollywood’s silent film history. Hollywood filmmaker Cecil B. DeMille filmed his movie The Ten Commandments in the Dunes for their resemblance to the Sahara Desert. After filming wrapped, he didn’t want his elaborate Egyptians set to be reused by anyone else so he dismantled and buried the site. The famous set was believed to be lost forever until 1983 when Peter Brosnan, a filmmaker and DeMille fan, discovered the lost set. His biggest clue that the set was still located in the sand dunes was from DeMille’s autobiography in which he joked that 1,000 years from now someone would discover his film set and think the Egyptians had traveled to North America. Today you can visit some of the uncovered artifacts at the Dunes Center and get a map to various viewing locations of the dunes. 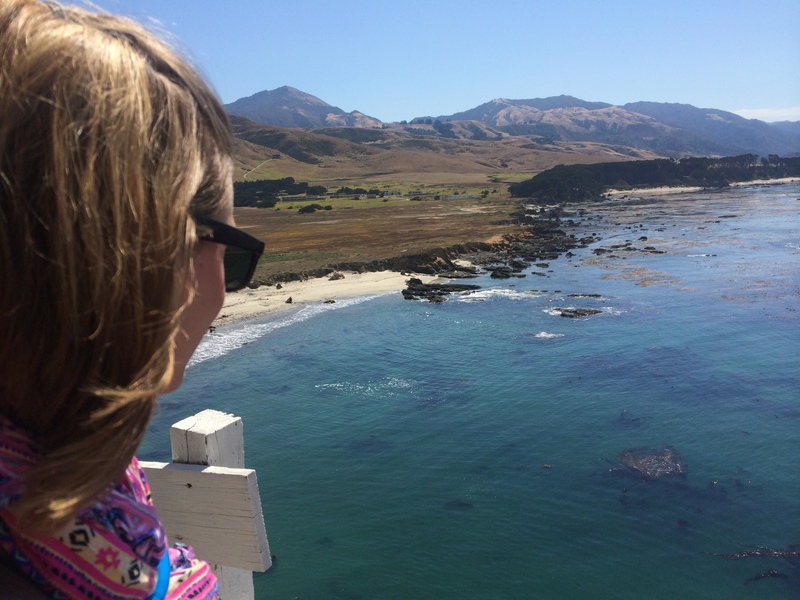 Continuing up the coast, our next pit stop was lunch on the beach in Cambria. 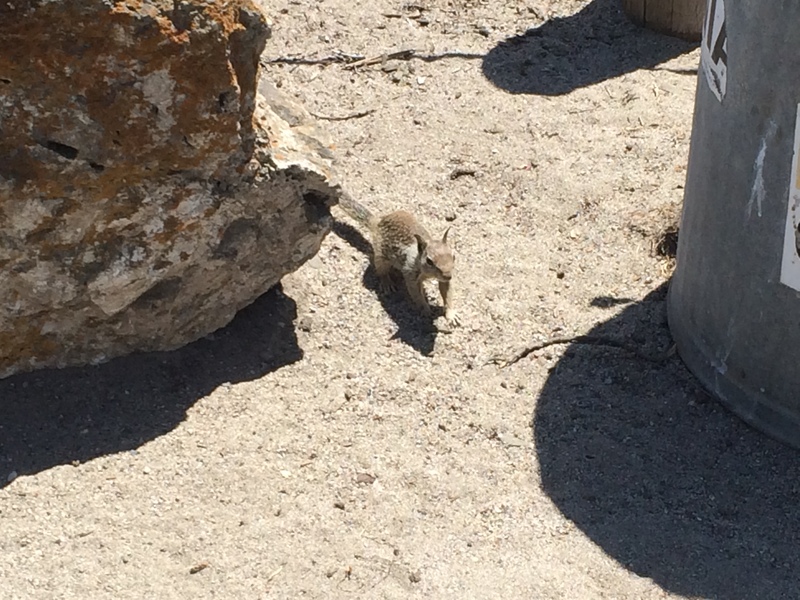 Against Hillary’s approval (and good judgement) I fed the little squirrel-chipmunk looking creatures near the beach…they very very quickly became my dear friends and followed me. I guess that’s why I should’ve followed the signs and not fed the animals lol. But it was only bread so that’s ok right? 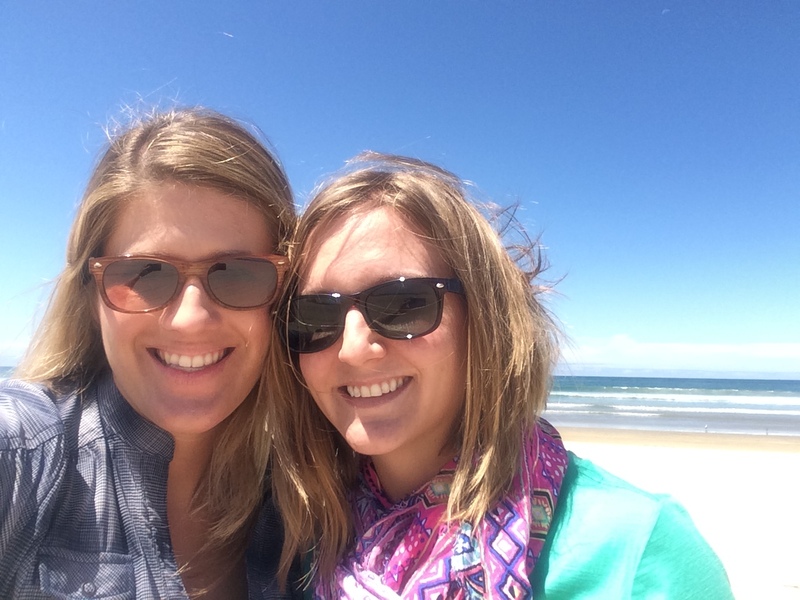 After I broke the rules, we made up our sandwiches and made for the beach to eat and stretch our legs. We did not venture into the cute wine tasting filled town of Cambria, but hopefully next time when I have more time to spare I can tour a winery. Enjoying the mountains on our drive up the coast! 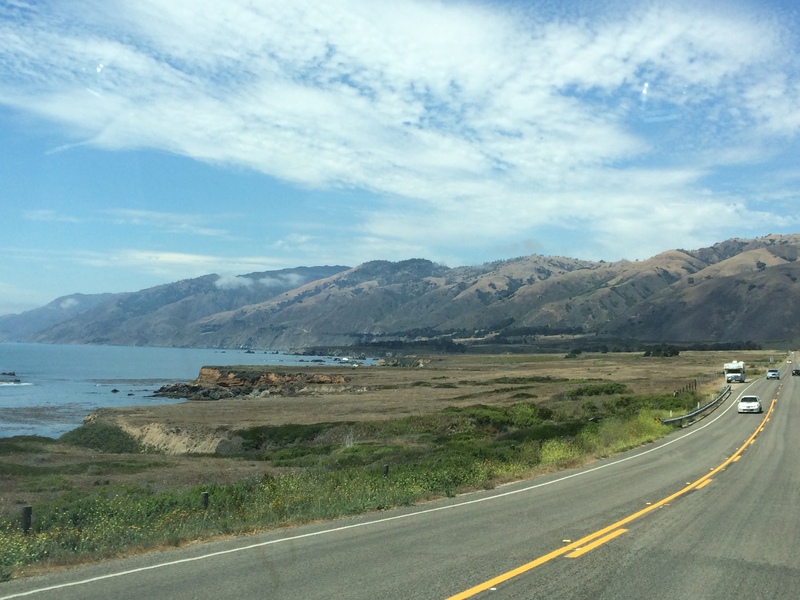 Slowly making progress…Highway 1 is not a quick route but sure is beautiful! Cambria was about our halfway point until reaching Carmel. It was also our last opportunity to bail off Highway 1 (not that that was our plan but until Monterrey there is no other highway to take), so from here on out the road got equally more scary and more beautiful. 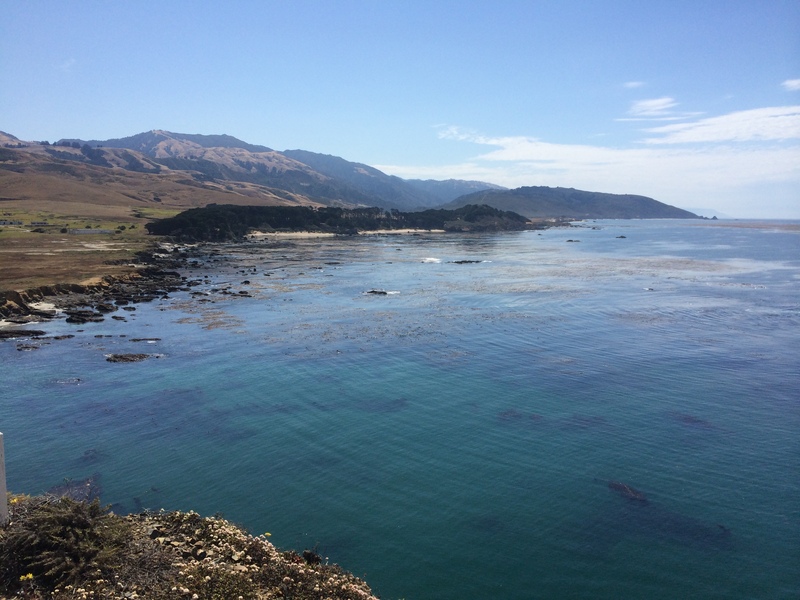 The Cambria to Carmel portion of our road trip is the views we came for – that Classic California coastal scenery with the ocean on one side and mountains on our other. Mountains on our right and ocean on our left! 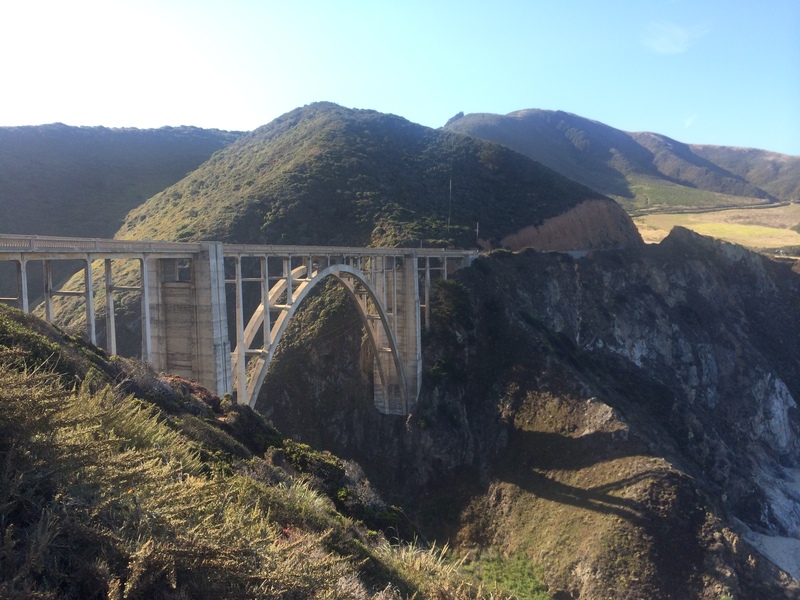 Once we were in Big Sur, I kept thinking every bridge was the famous Bixby Bridge. Bixby is that you?? 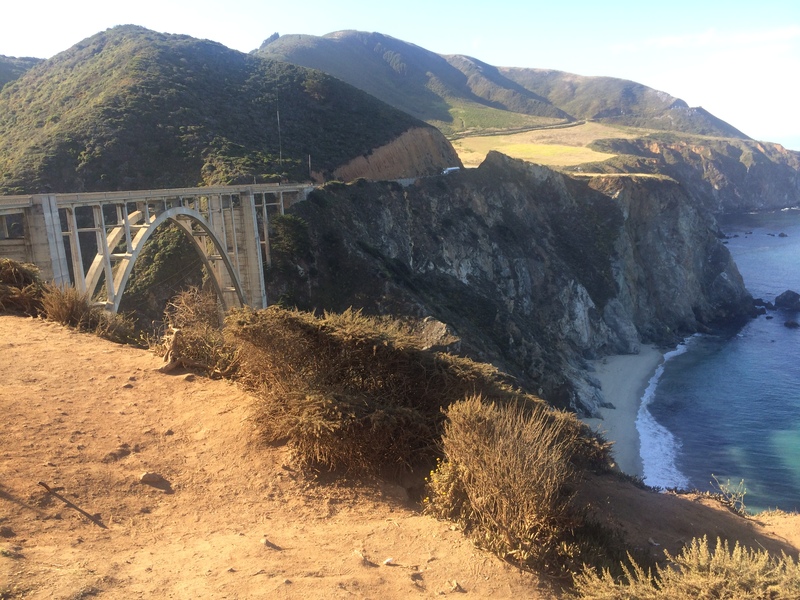 Nope, just Fake Bixby Bridge. A couple more hours into our drive and 1/3 of my camera’s memory later, we decided to stop for our first hike of the trip . 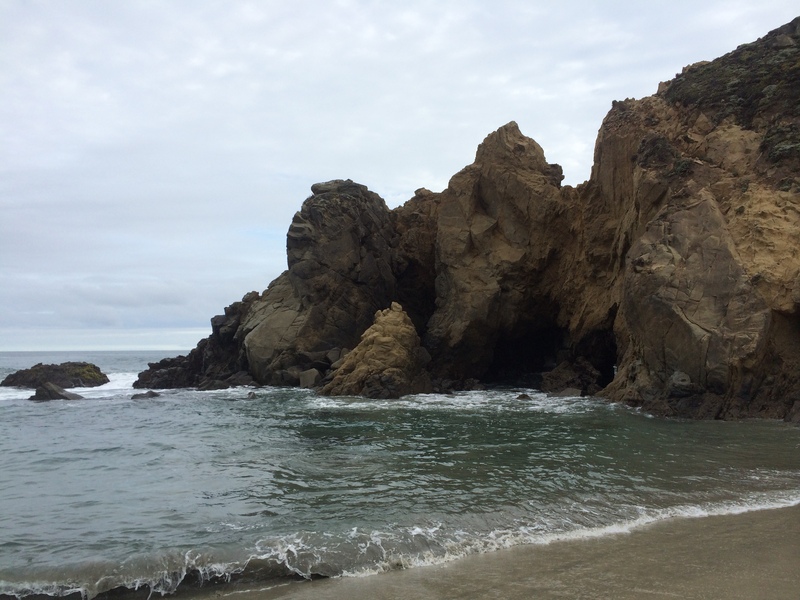 Partington Cove is just one of the many unmarked surprise gems in Big Sur. 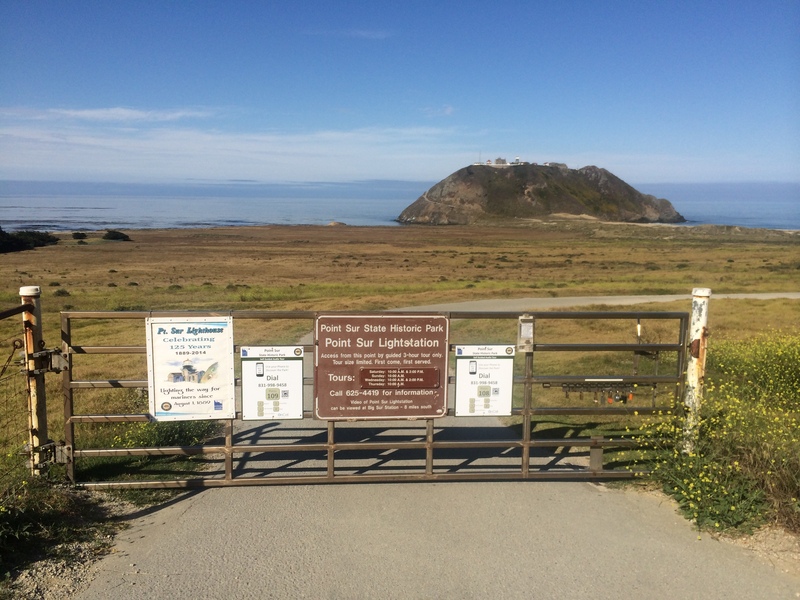 Though the trail is unmarked we knew to look for a metal gate on the ocean side of Highway 1. And the trail wasn’t as difficult to find due to several cars parked along Highway 1 near the gate. 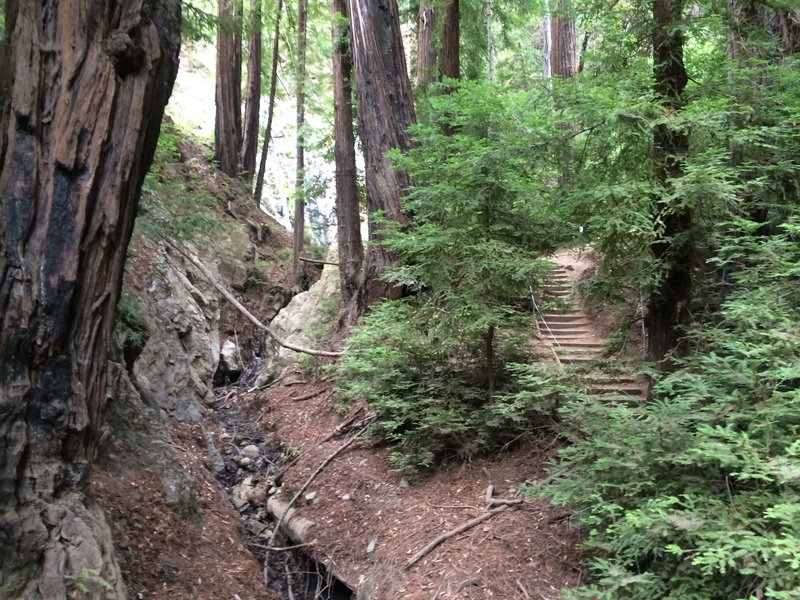 I don’t think this hike is quite as secret anymore, especially in today’s Internet age, but even on a Saturday during the summer the trail was not over crowded. Beyond the gate is a wide dirt trail with a beautiful view of trees and the ocean that leads down to the water. When you level out on the trail you will come to crossroads. Take the path that crosses over the bridge and it winds around til you meet the tunnel. 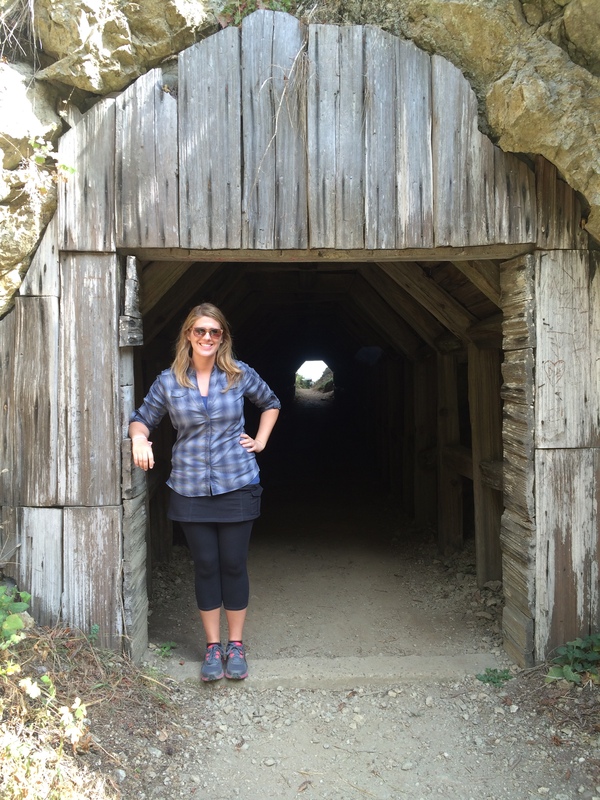 Then travel back in time through the tunnel (or at least that’s what it felt like to me…like I’d been transported back to an 1800s mine!) After you pass through the 60 foot tunnel you come out to a view of the ocean! You wind along a fenced trail for a bit until you reach a bench to relax and take in the secluded view. And that’s the end of the trail (obviously!) unless you have a boat waiting for you. 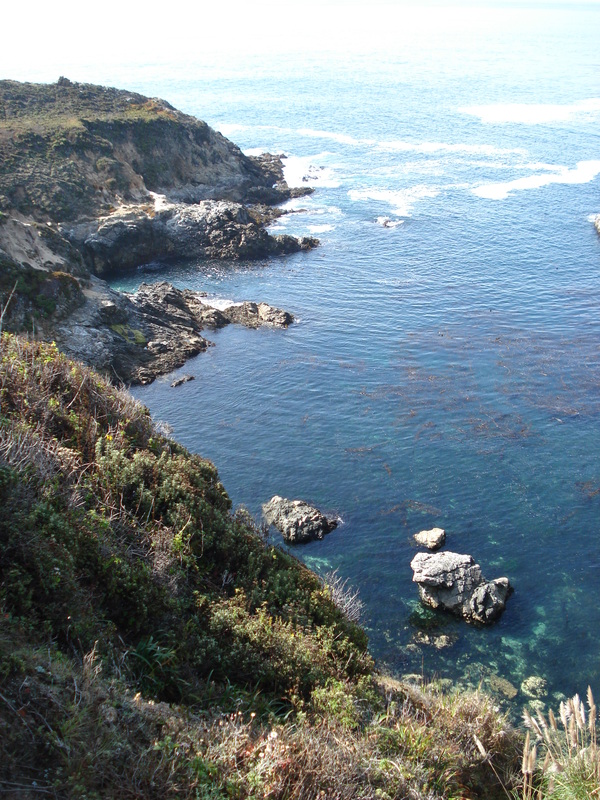 Partington Cove directions: Traveling north the trail head is about two miles north of the Julia Pfeiffer Burns State Park Entrance. 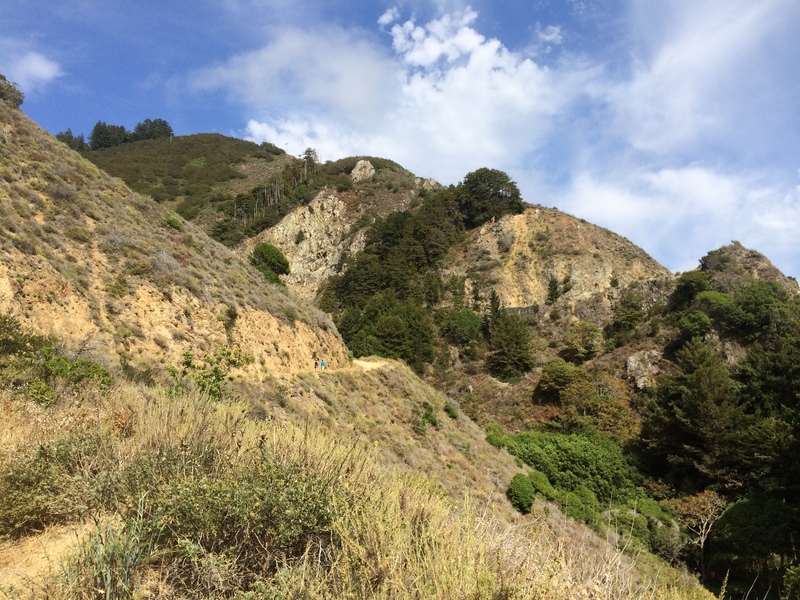 Or traveling south the trail is about nine miles south of Pfeiffer Big Sur State Park Entrance. We finally reached the bottom and some shade! Right before the bridge there are two other trails to take, but the bridge takes you to the cove. It felt really great to walk and stretch our legs after hours in the car. On the other side of the tunnel is the cove! At the trail head it was very hot and we were sweating, but by the time we reached the cove the temps were cooler and the ocean breeze was welcoming! I love the deep teal color of the ocean here! Such a tranquil and gorgeous view! 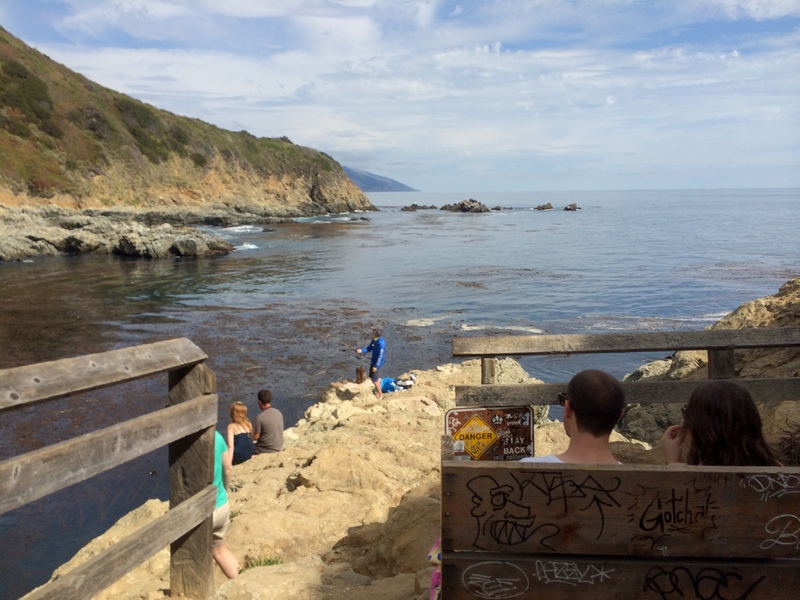 Since we were hiking on a Saturday during the Summer the trail had decent traffic and we were not the only ones to sit and rest at the cove. But there were only five other people with us so it was still a peaceful experience to sit and watch the waves crash against the rocks in the cove. 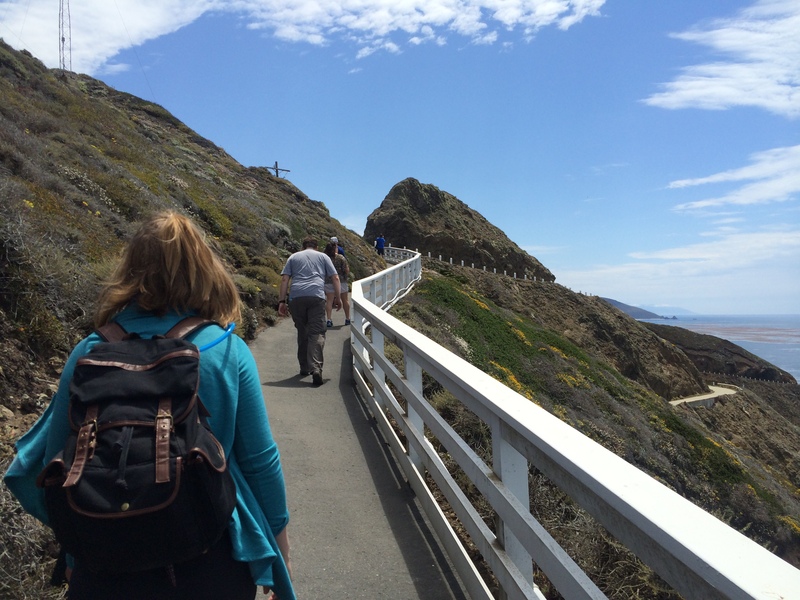 I would love to visit this hike again because it was an easy, somewhat secluded hike that offers spectacular views! For you history buffs like myself this paragraph should be interesting…or you can skip to the next paragraph. 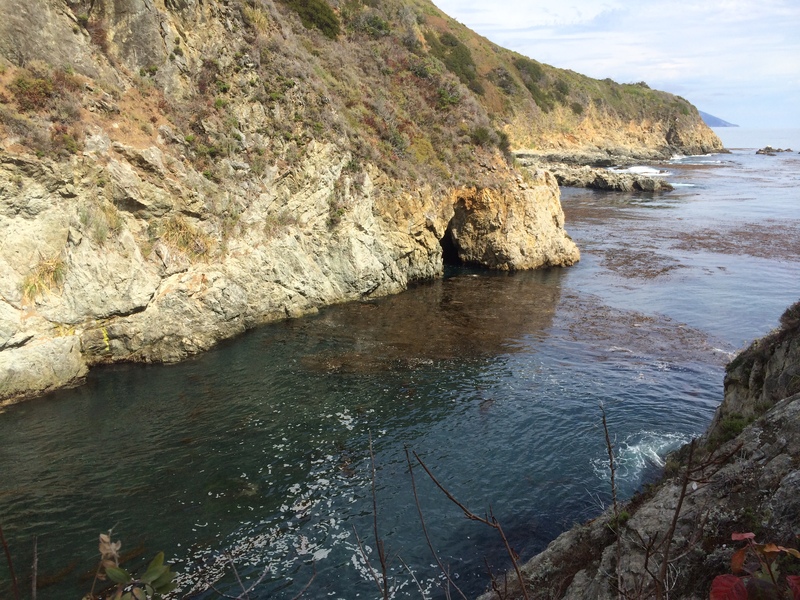 Partington Cove is named after John Partington who, beginning in the late 1800s, established a business of cutting and hauling the bark of tanbark oak to ships. Partington Cove was chosen for it’s mostly calm and deep waters. 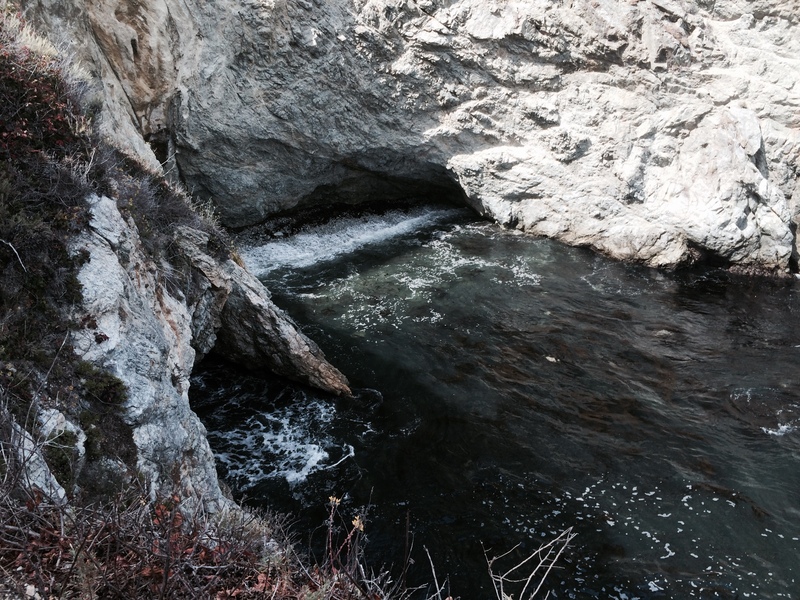 The tanbark was carried by mules down the canyon and through the tunnel and then onto ships anchored at the cove. Rumor has it during prohibition the cove was a popular dock for smuggling alcohol. Partington Cove also played a role in the construction of Highway 1, providing a landing dock for bringing in equipment and material. 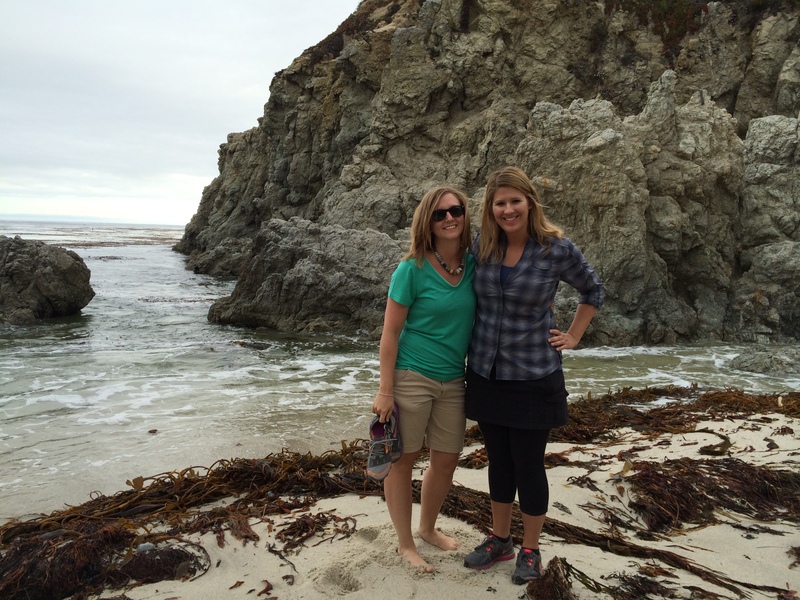 After stretching our legs on the hike, we hopped back in the car and continued our trek to Carmel-by the-Sea. During our drive we kept our eyes peeled for the famous Bixby Bridge (you might not know it by name but I bet you $50 if you google “Big Sur” that bridge will show up in a majority of the photos) and not knowing exactly where Bixby Bridge was located on Highway 1 I thought we found it twice and even made Hillary and I take a picture at one of them just in case it was Bixby, but Hillary was correct in telling me that those were not the actual famous bridge. Finally we did come across the real McCoy but the best view was on the other side of the highway so we decided to bookmark it for the next day and continued on. 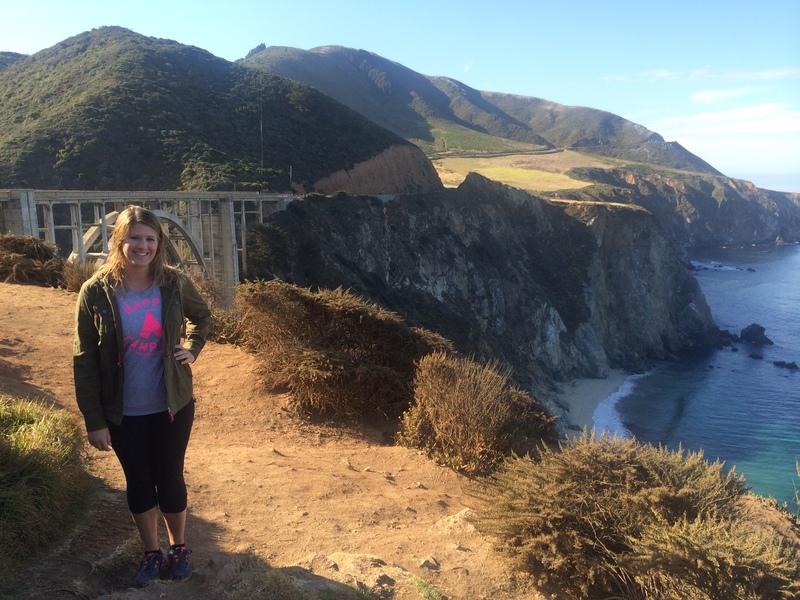 We found the real Bixby Bridge! 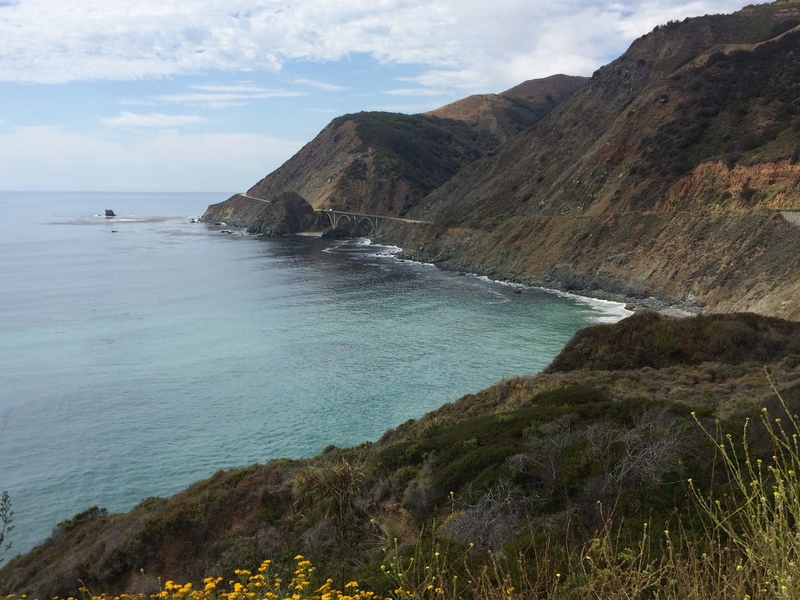 The bridge was built to more easily connect residents in Big Sur to Carmel, who were basically cut off during winter due to the often impassable road that led 11 miles inland. Posing in front of one of the most photographed bridges on the Pacific Coast! 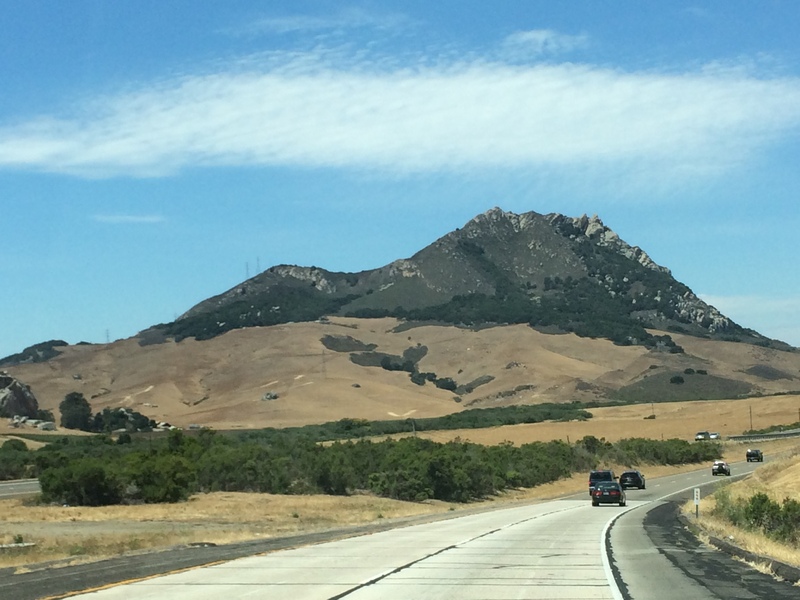 The iconic image of Central Coastal California. View of the Pacific Ocean from the Bixby Bridge vista lookout. A little over an hour later and two Bixby bridge fakeouts later, we reached our shed in the woods for the next two nights. Yes I said shed. I could also call it a shelter or maybe a tree house (not in a tree though). Granted when we booked this Airbnb we knew it was not a glamorous location…it was called a crashpad in a garden, but we were not quite prepared for camping because that’s basically what we ended up doing. Camping. Honestly I would have rather camped because then my expectations would have been met. Our hosts, though a little odd, were very nice and showed us around the property when we arrived. 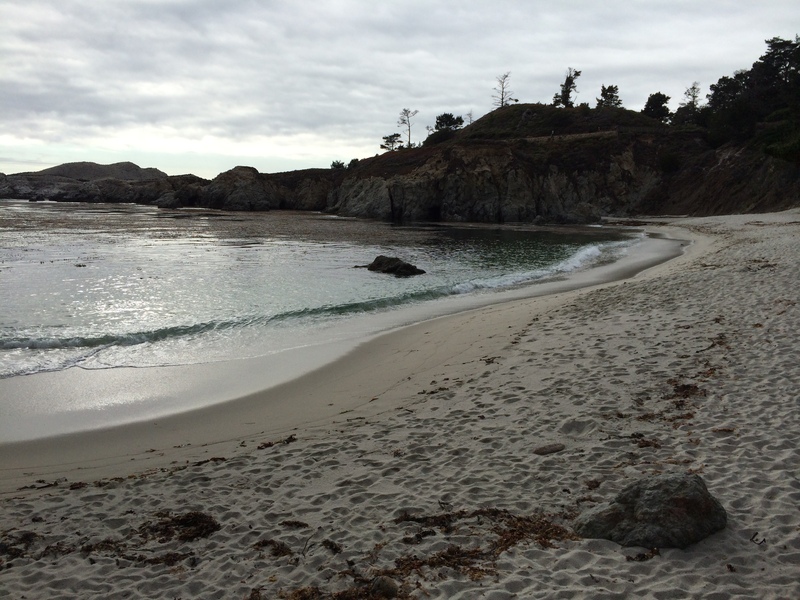 Our host even took us to a private beach cove a mere five minute walk away from our shed. And this made the whole accommodation worth it! Really the location in general was perfection. 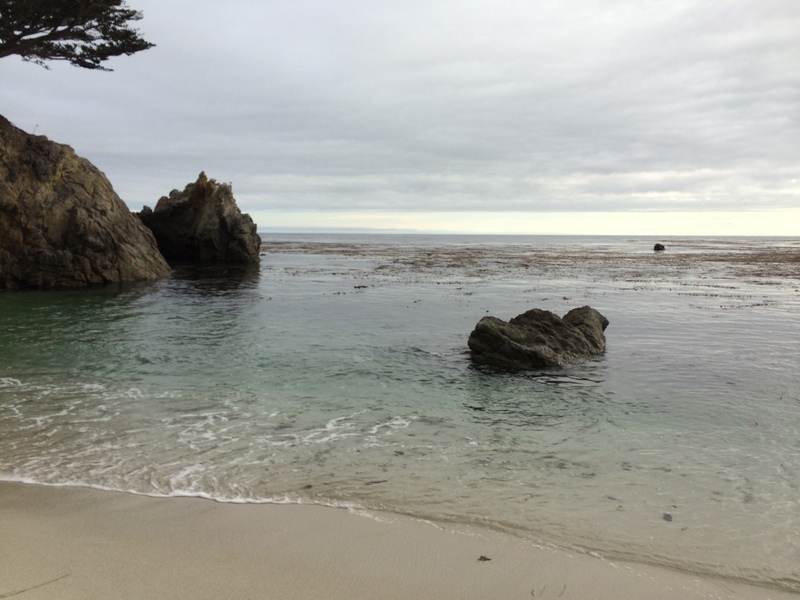 We were 10 minutes from Carmel and 30 mintues from Pfeiffer Big Sur State Park and within walking distance to a gas station/convenience store and OUR OWN PRIVATE BEACH COVE (essentially…I mean not really ours but not many people know about it or at least they don’t know how to get to it). A peak at our secret beach from the trail down! 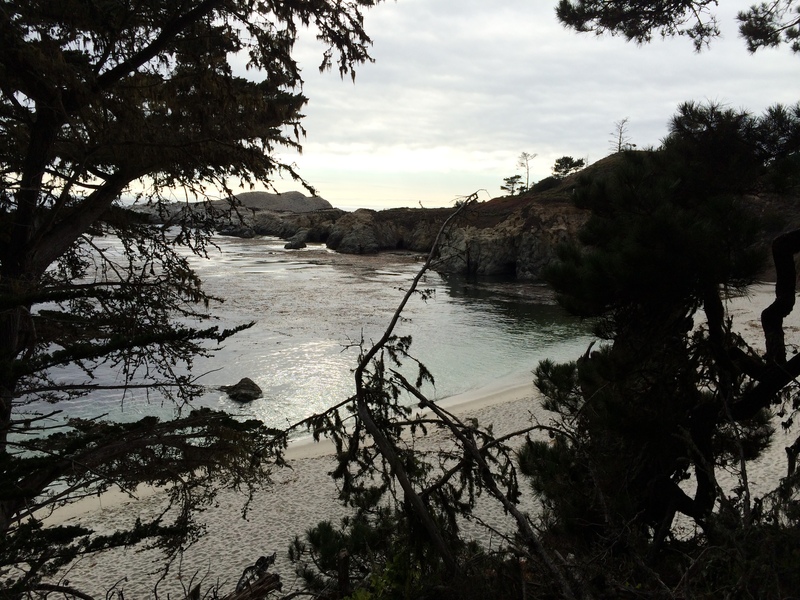 You can also access this beach from Point Lobos State Reserve but that staircase is not clearly seen from the trail so most people do not know how to access this beach. The water was so clear and this beautiful sea green color. 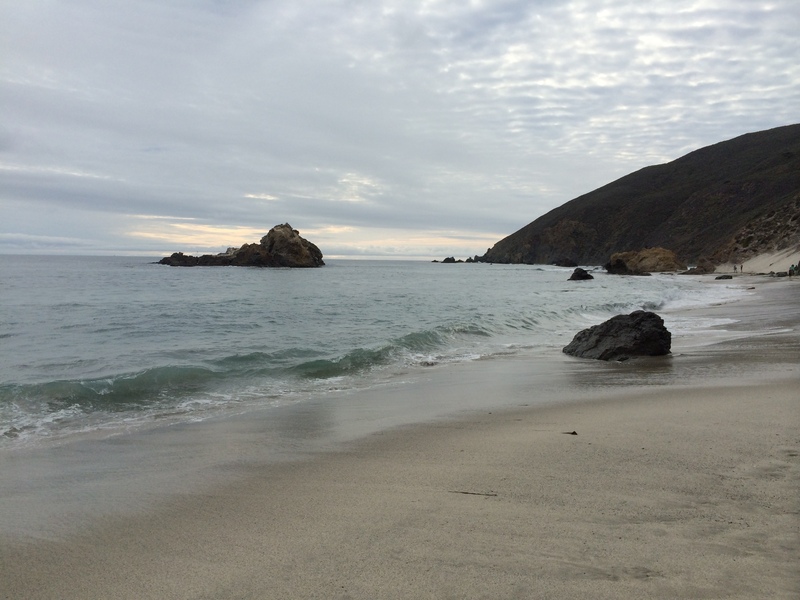 This might be one of the only times I’ve been alone on a beach…pretty awesome. The hidden set of stairs in the neighborhood across the street from where we were staying. The sand here was unlike any I’ve ever seen…it was very coarse and not as fine as typical sand. Our host kindly took one of the few non-selfie pictures of Hillary and I haha. After spending some time exploring the secret cove and admiring its unique sand, we headed back to our crashpad and ate dinner that we packed in our cooler before crashing for the night. We were exhausted and had a full itinerary for Sunday! After an questionable night’s sleep thanks to the massive skylight in our shed (which is so perfect for when it STORMS, which of course it did that night) and an interesting morning (i.e. bathing with a dog bowl because there was no way I was taking a bath (no shower) in our dingy bathroom and the only container handy for rinsing off was a dog bowl lol), we walked over to the convenience store to grab some pastries and coffee and filled up our gas tank before heading off to the Point Sur Lighthouse. 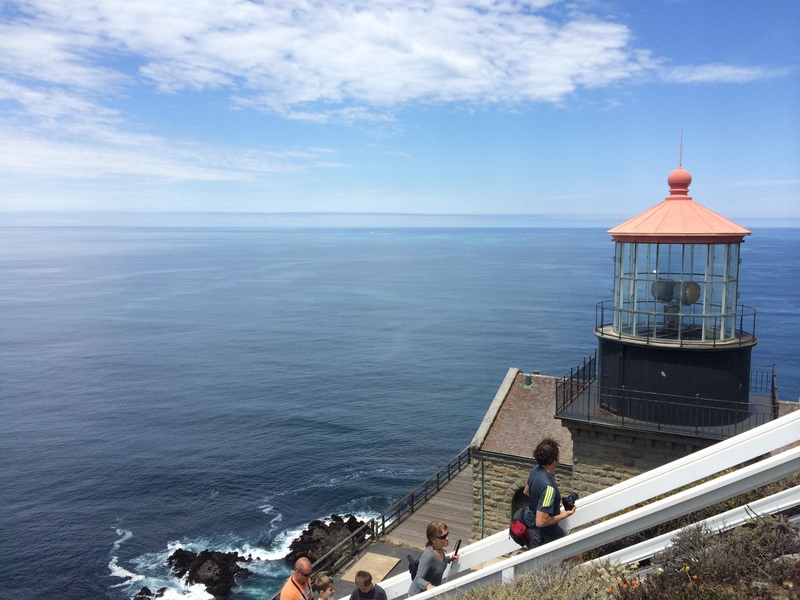 This lighthouse has been on my bucket list since my mom and I drove to San Francisco in 2011 and I spotted it from the PCH. You can only visit at certain times so I vowed to come back and thankfully I was able to return in just under three years. 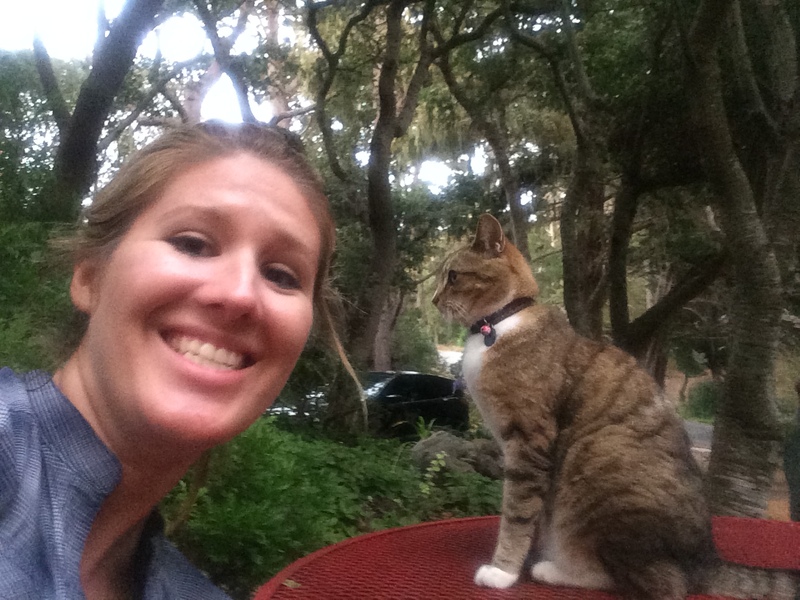 My interest also spiked exponentially after Ghost Adventures visited Point Sur and filmed an episode there. Hillary and I are huge fans and if there was only one place we had time to visit in Big Sur it was going to be the Point Sur Lighthouse! For tour times and information click here! 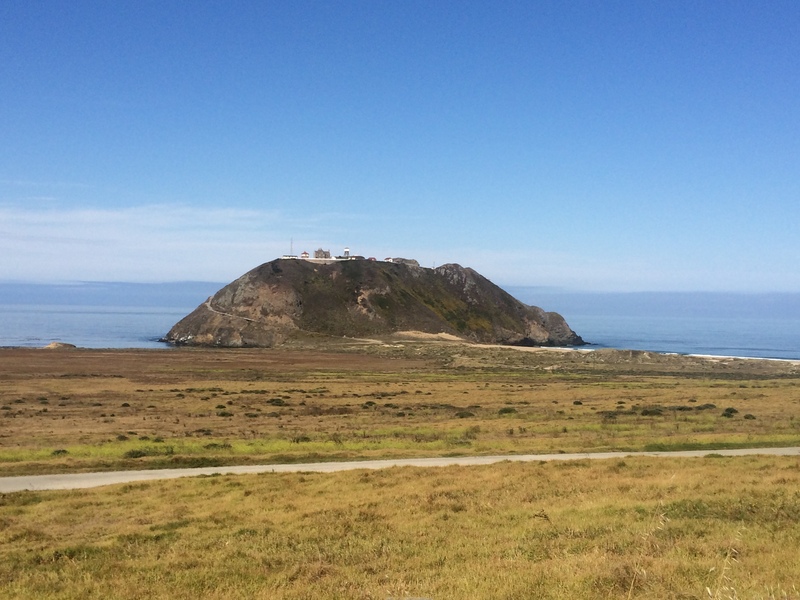 Point Sur sits 361 feet above the water on a large volcanic rock. Too bad this beach is closed to the public (or anyone really) because it is a great beach! Enjoying the view on our way up the rock! Since the road was a risky route, the shipments of supplies would come in by boat to a dock directly below this spot. Then it was hoisted up the hill on rail road tracks. 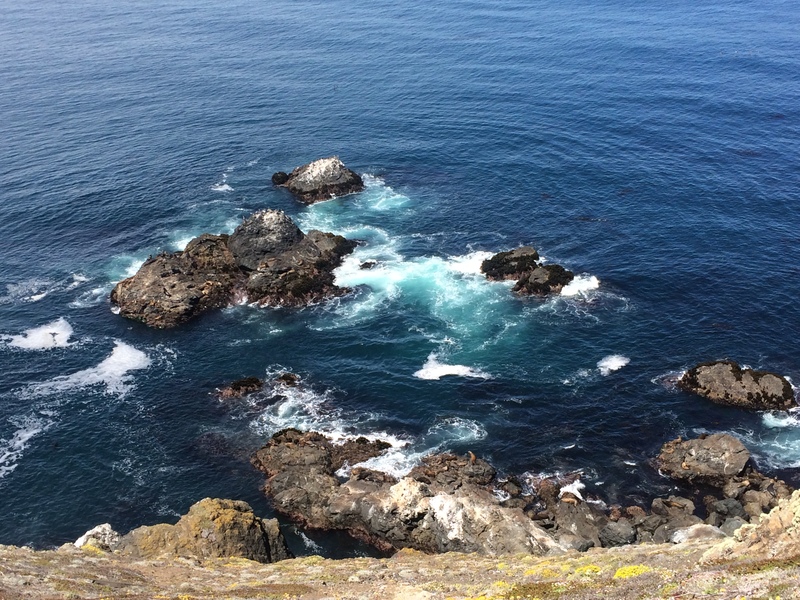 You might not be able to see them in this picture, but we sure could hear the sea lions the entire time we were at Point Sur. I would love to do one of their ghost tours during Halloween! Or a moonlight tour at least! 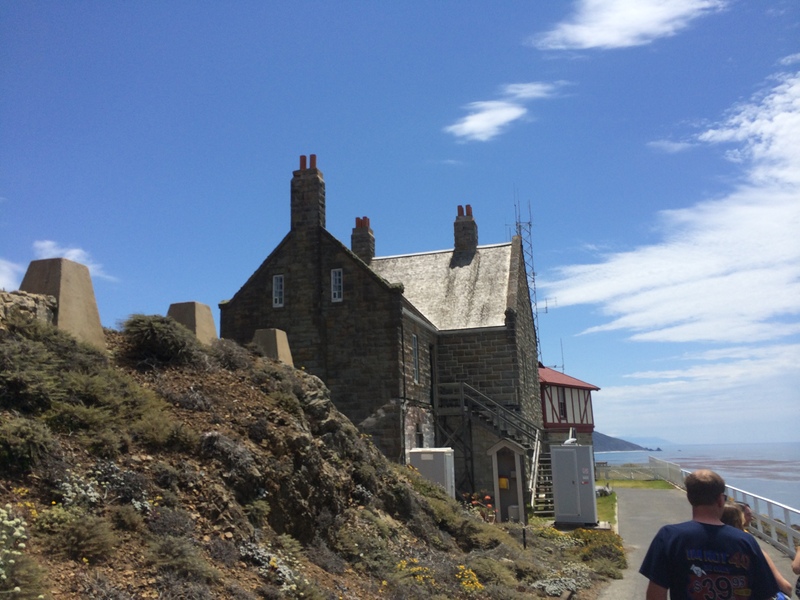 Point Sur is technically not a light house, but rather a light station, because it has multiple buildings. 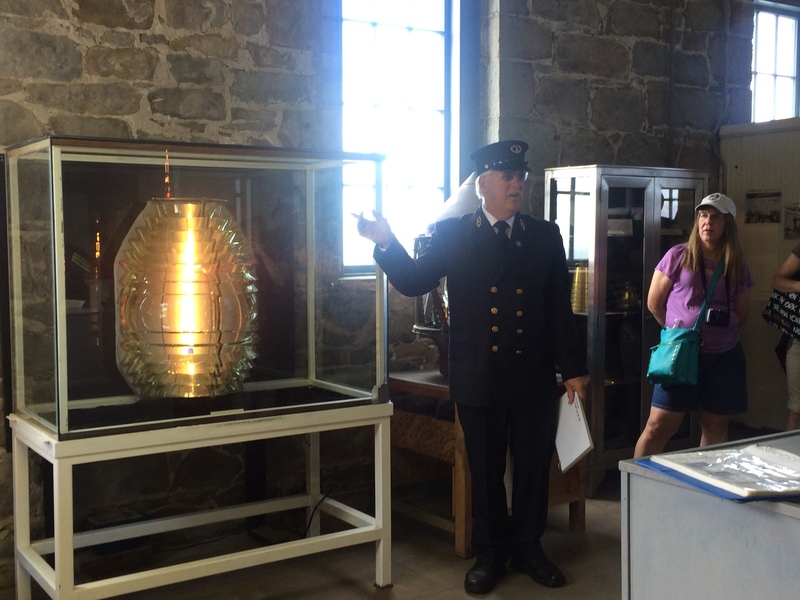 Our guide at the light station explaining the lens. 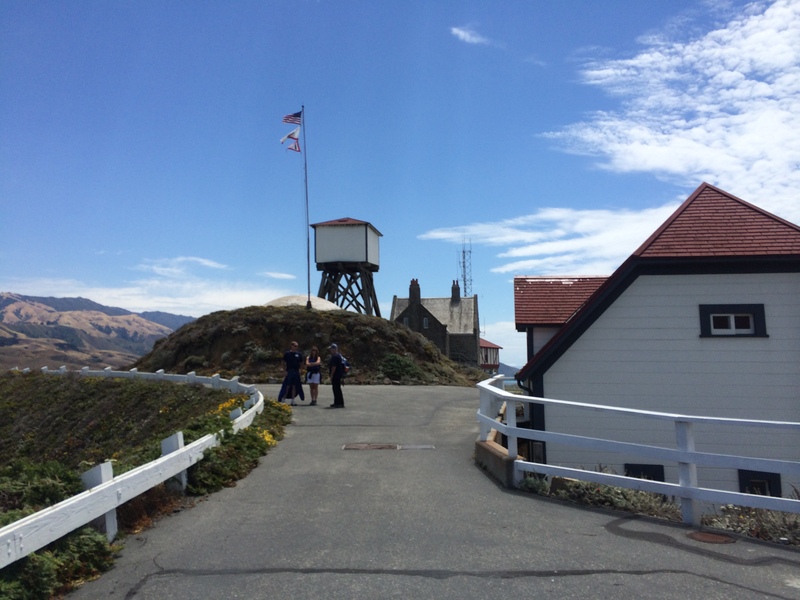 The Coast Guard still controls the light, but In 2004 the Coast Guard transferred the building and land to California Department of Parks and Recreation. 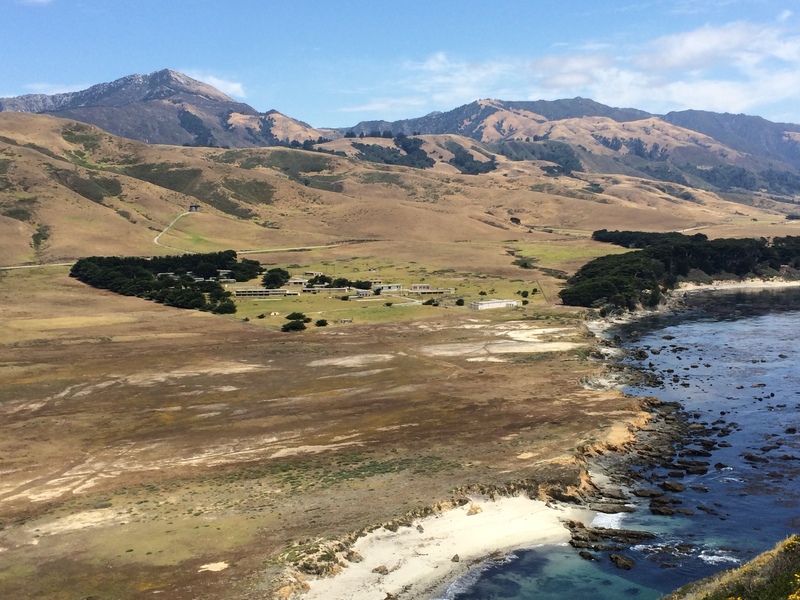 Point Sur stands as a silent reminder of the past. 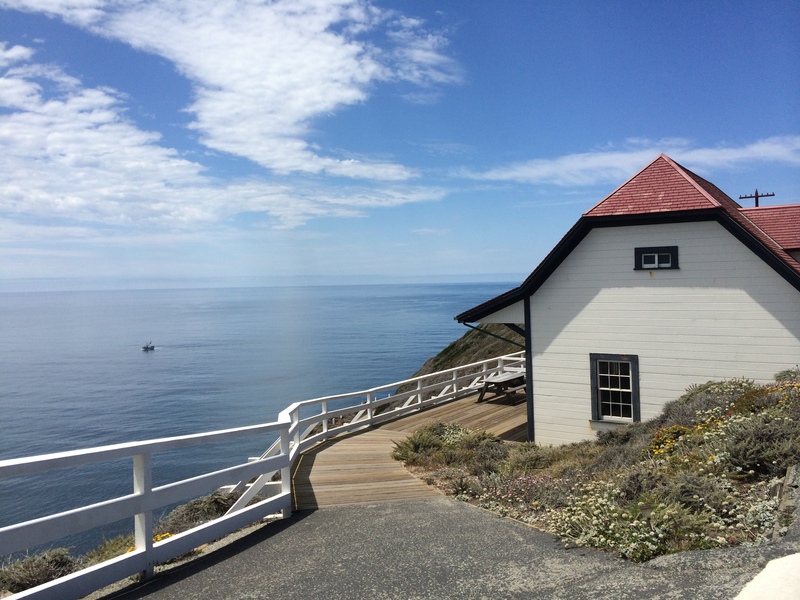 It is the only complete turn-of-the-century light station open to the public in California. 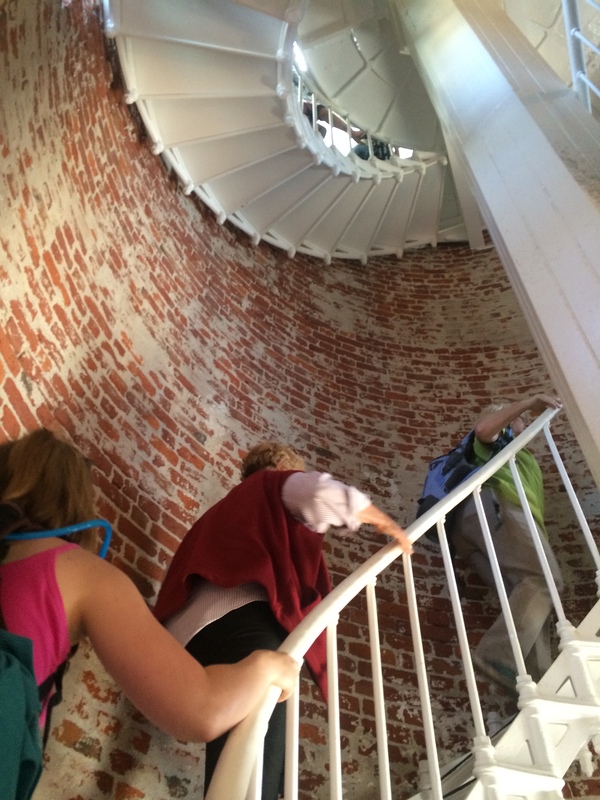 Winding our way up to the top of the lighthouse! 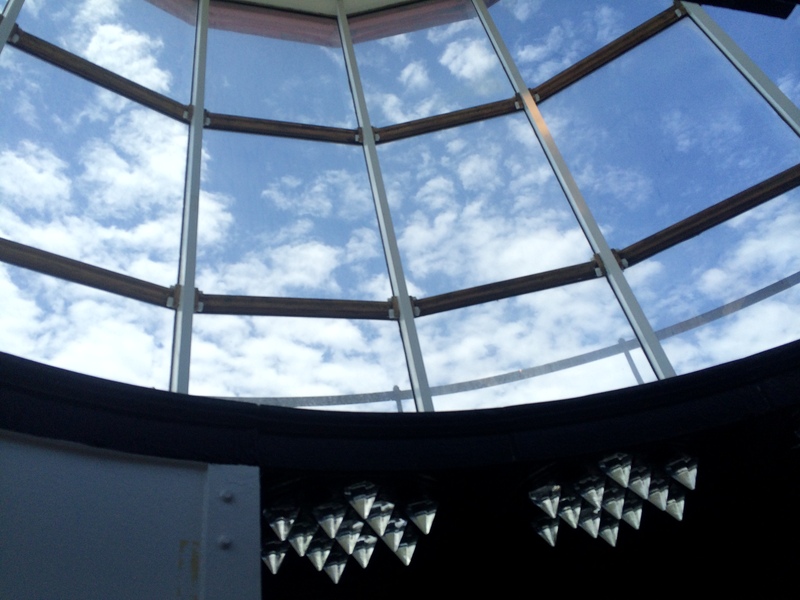 It was very hot and stuffy inside the top of the light house but it was very cool that we got to see the light from the inside. 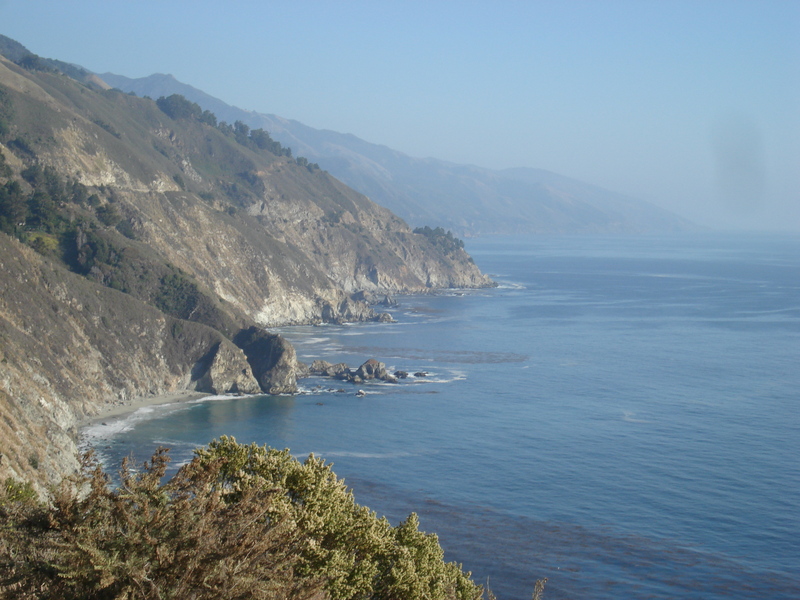 Prior to the construction of Highway 1, Big Sur was one of the most remote regions in the state. 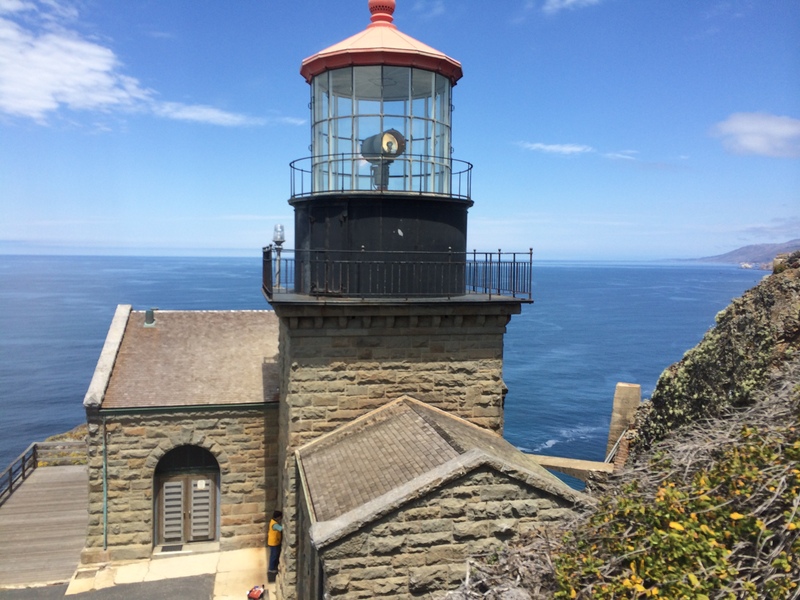 The original Fresnel lens was moved to the Maritime Museum of Monterey. 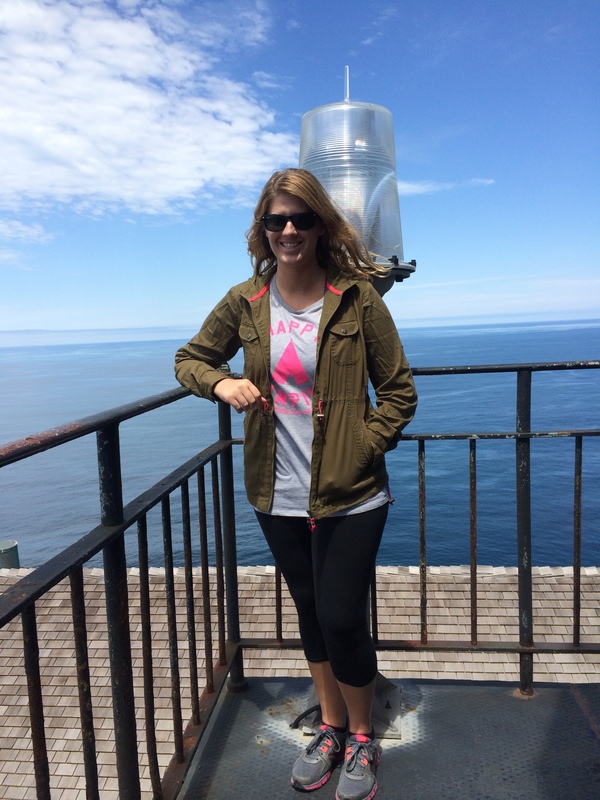 It was an amazing view at the top of the lighthouse, seeing the ocean for miles and miles. 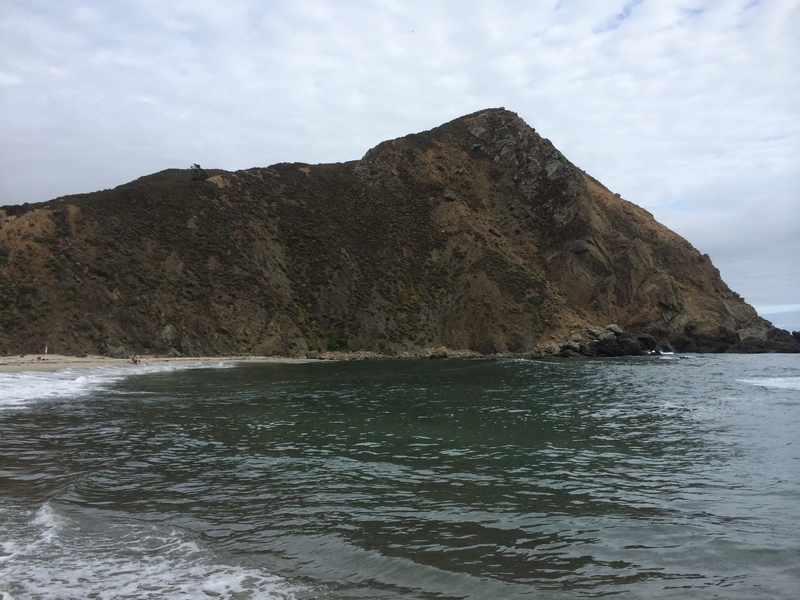 Point Sur was a dangerous area for ships from the first settlement of California, and especially after the California Gold Rush many ships wrecked here. 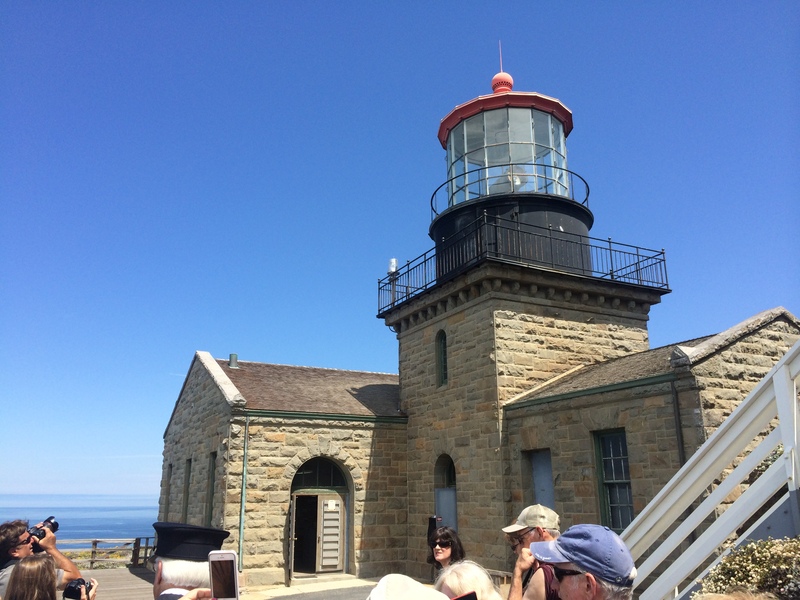 Finally in 1886, Congress appropriated money for construction of a lighthouse and it was completed in 1889. 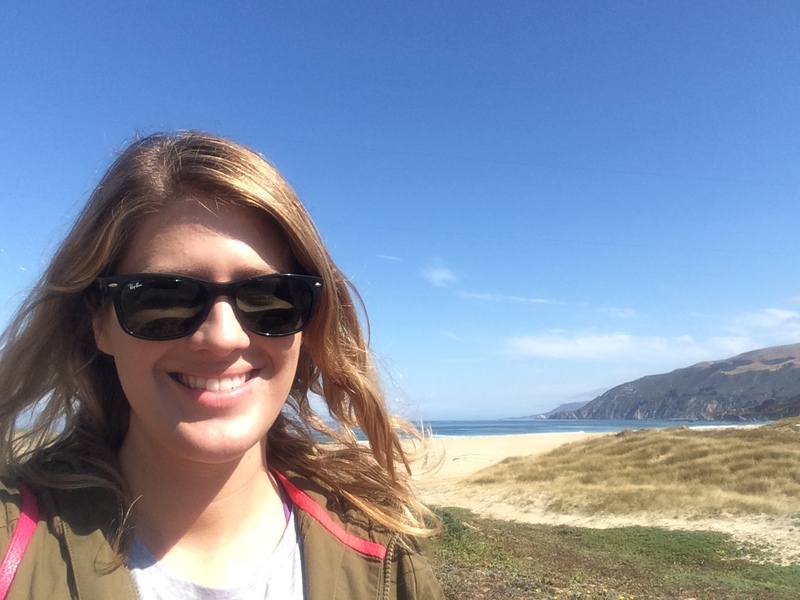 Can you imagine just how off the grid life was at Point Sur?! What an incredible experience to live there. Since life was so isolated at Point Sur, horses and cattle were kept on the ground and often enjoyed time on the beach just like the people! The staff of the station consisted of a head keeper and three assistant keepers, all of which lived at the station. 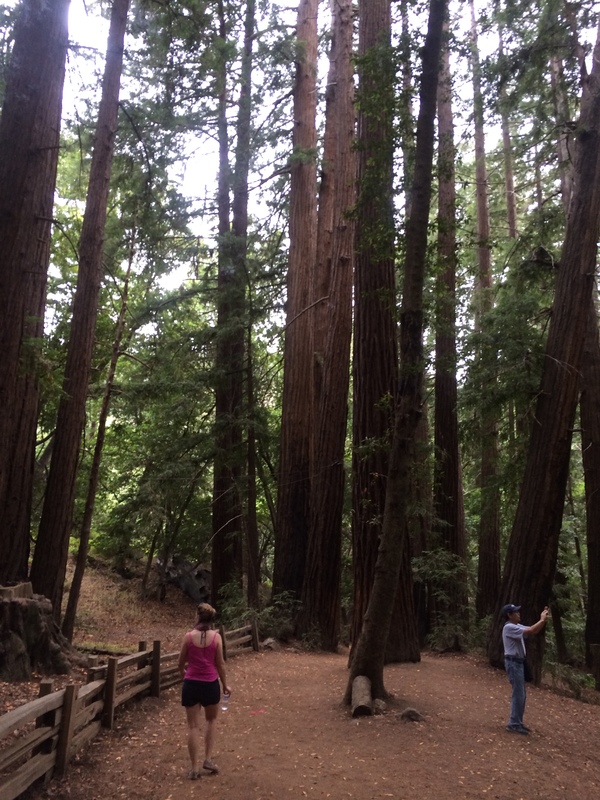 The one time in our three days at Big Sur that we had even the slightest service was at Big Sur. And that’s thanks to AT&T asking permission to build a tower on the property, which the lighthouse site granted if AT&T built the tower as a reconstruction of the water tower. 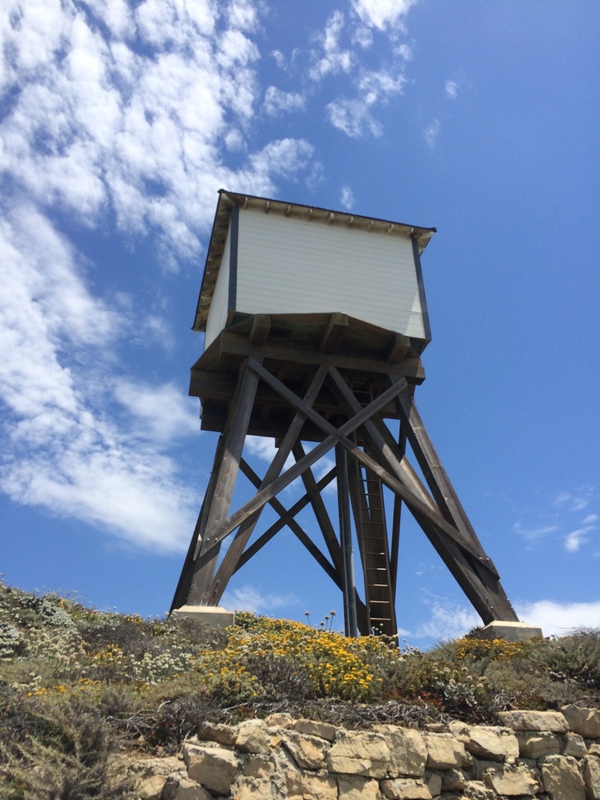 From 1899 until 1974, families lived and worked on Point Sur, but today it is a ghost town, becoming one shortly after the light became automated in 1972. 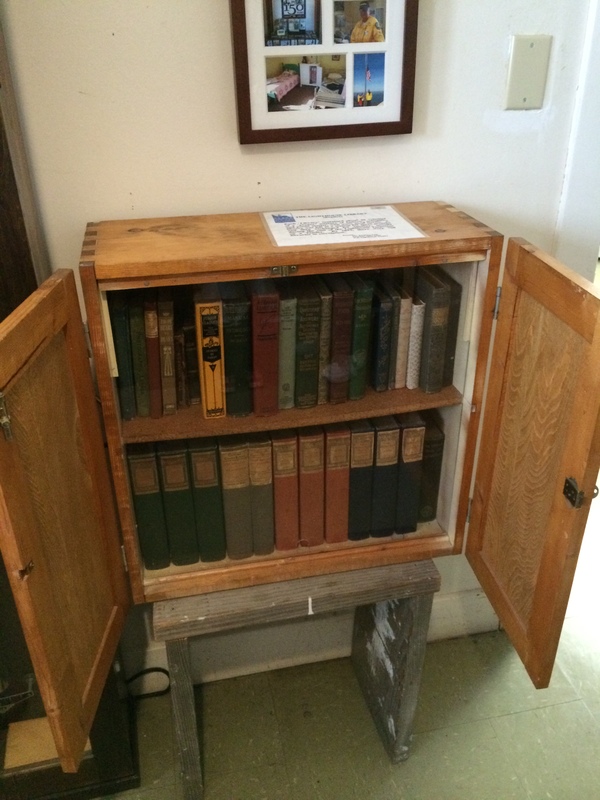 This is a traveling library that the residents received along with their supplies about every four months via boat since the only road was to Monterey and it was a dangerous and slow trek. After several big shipwrecks left many people to die due to Point Sur’s inaccessibility, the only doctor in the area demanded Highway 1 be constructed to provide quicker travel in emergencies. 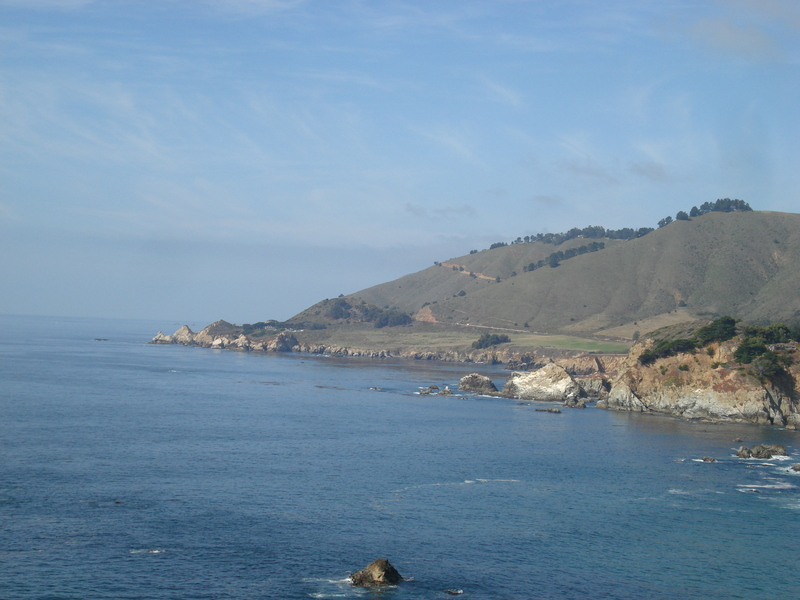 After years of petitioning, Highway 1 was completed in 1937, connecting Big Sur with Monterey to the north and San Luis Obispo to the south. Whales are often spotted along the coast here. Sadly we did not spot any. But we did see dolphins! 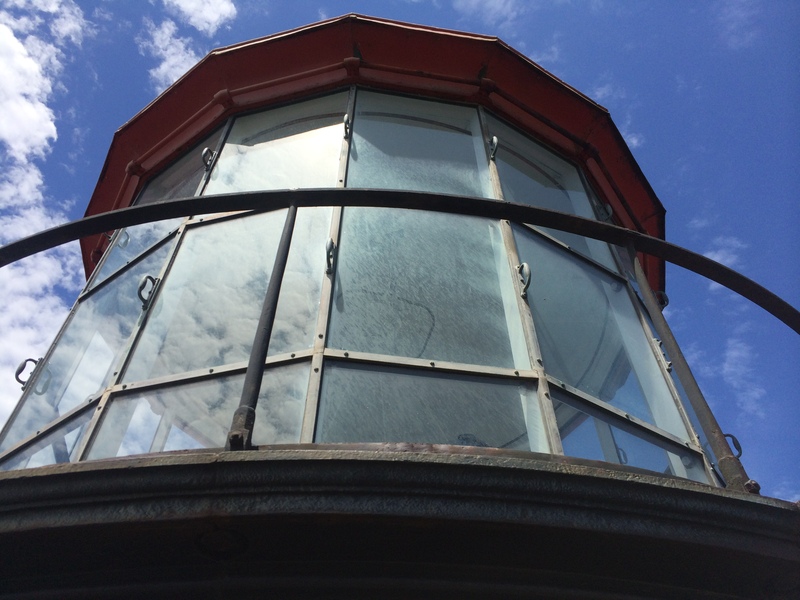 My favorite thing we did in Big Sur was the lighthouse. 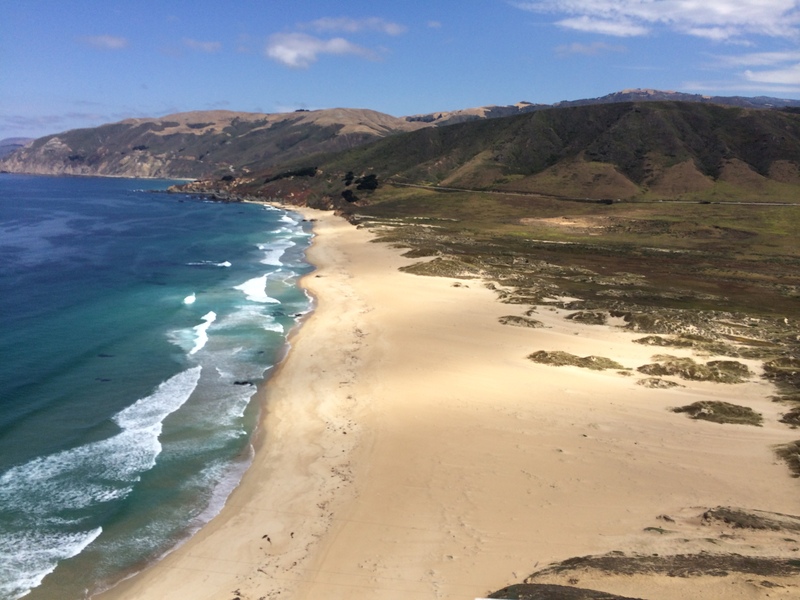 Point Sur is beautiful, and so isolated and so peaceful. I can see why it would be alluring for people to live that tranquil and simple life here, but it would not be without its difficulties and inconveniences that’s for sure. 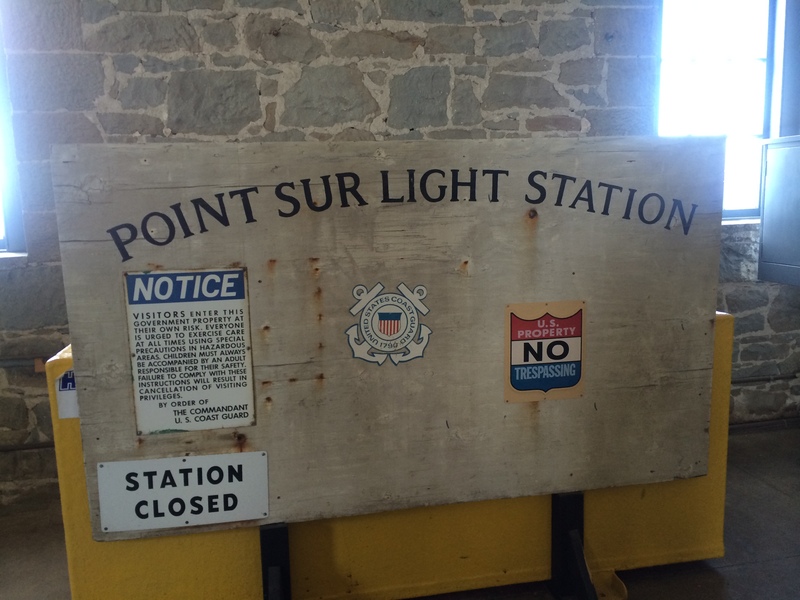 I was hoping for some drama and juicy stories regarding life at Point Sur, but I was sadly disappointed. I mean, you know there had to be some drama with only 3-4 families living on the rock! But it looks like the families really enjoyed each other and their time together. The children wore Halloween costumes and made yearbooks and had fun playing on the beaches with each other. 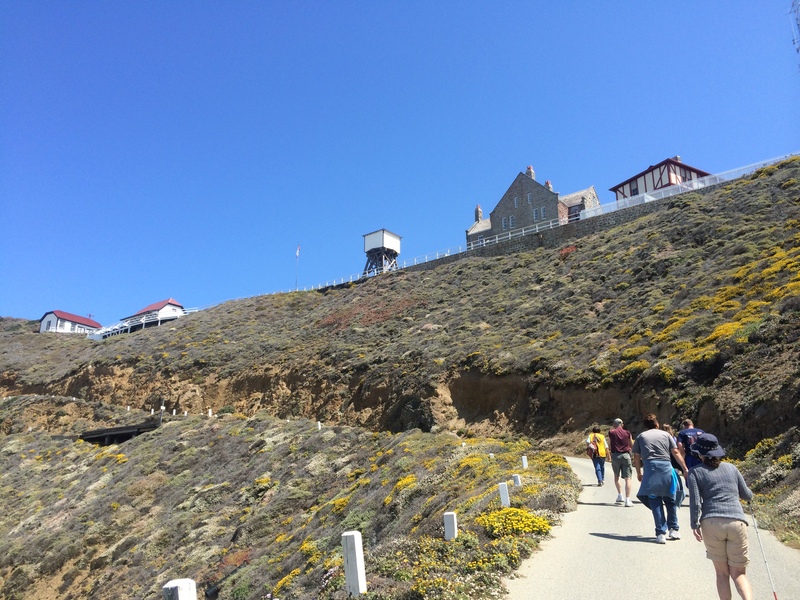 Our tour guide said they often have the children or relatives of the families that lived at Point Sur, and they only have happy memories and good stories to share. 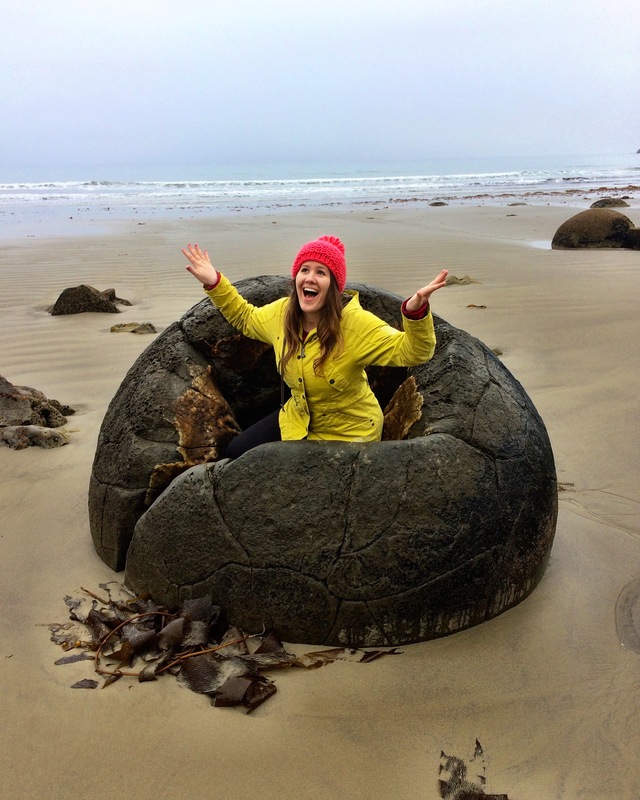 Everyone truly enjoyed their life on the remote rock. We did manage to doze off for a bit, and were then ready to hike! 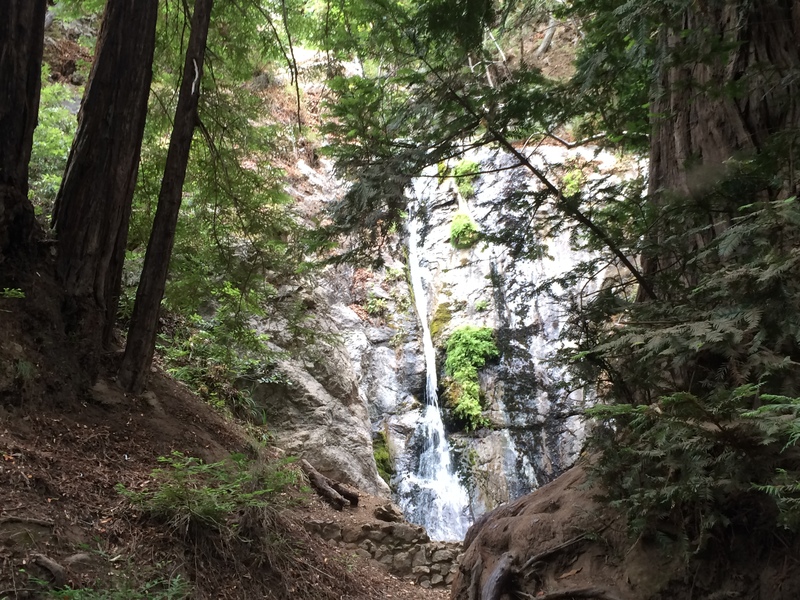 I chose the well known Pfeiffer Falls hike because who doesn’t love a waterfall! 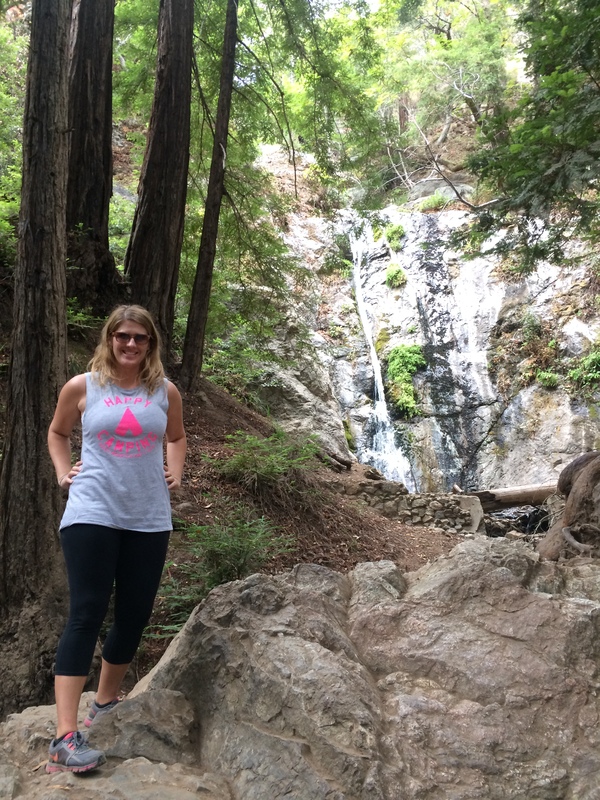 I personally want to be rewarded at the end of my hike with either a spectacular view, a waterfall, or a bar, Since the latter is a rarity on hiking trails, waterfalls are the next best! Also I had done the first half of this hike with my mom three years ago, but her knee gave out on her and we needed to turn back. But this time I wanted to go all the way and see what I missed last time. So we made it to the falls and it was beautiful! 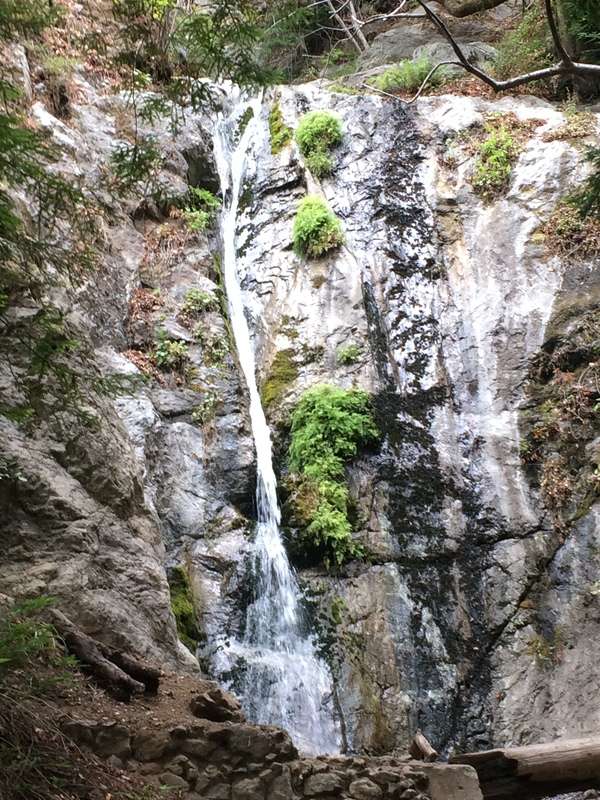 I’m ready to see this waterfall! 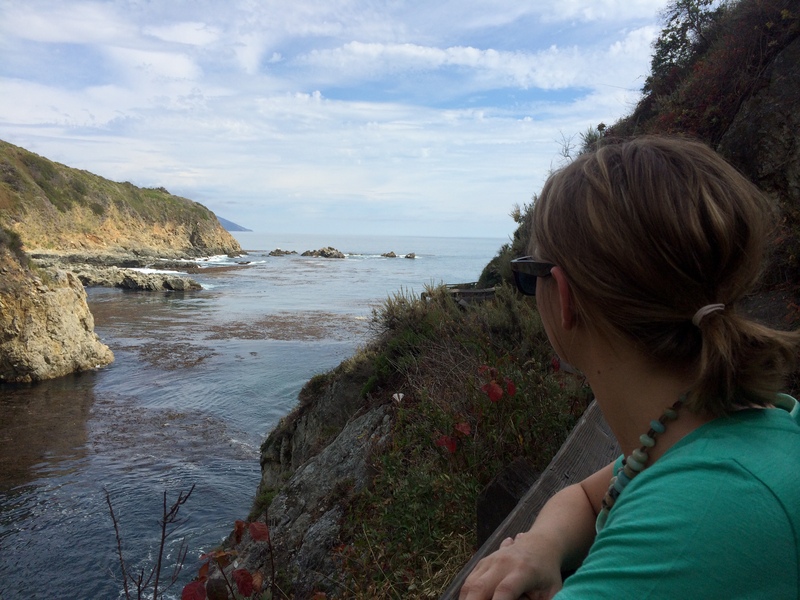 **I was not prepared for just how off the grid we would be in Big Sur…I knew service would be spotty but didn’t think it would be zero. Not that I needed to communicate with anyone, but it’s good information to know for visiting the area! 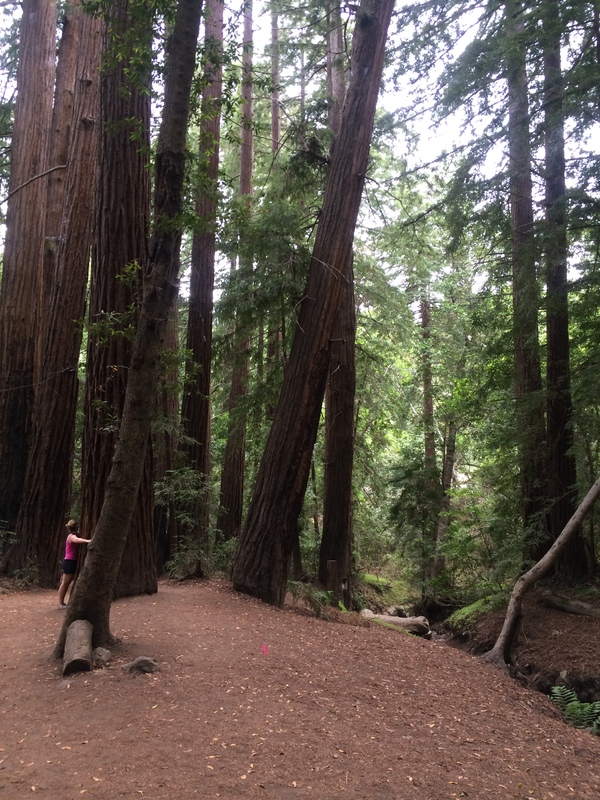 Pfeiffer Big Sur State Park is 1,000 acres of perfect climate and lush scenery for hikers and campers. 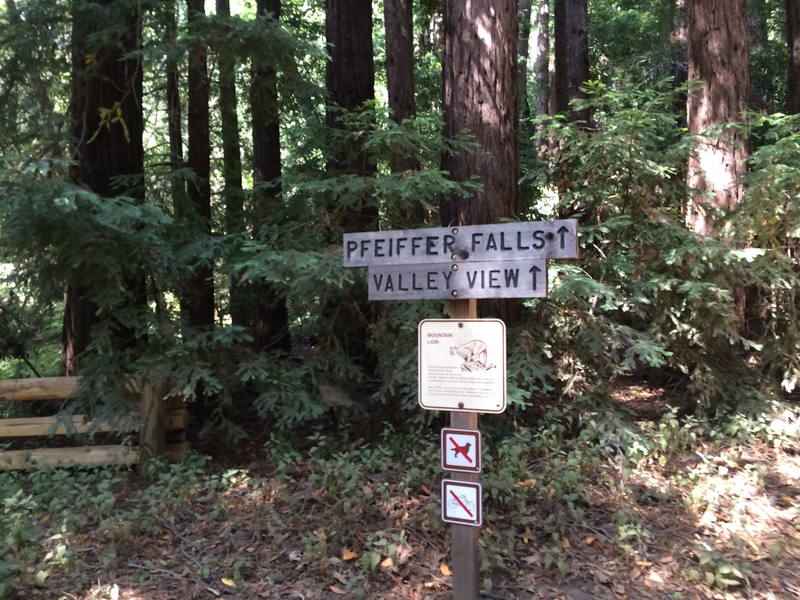 Pfeiffer Falls is a great hike…a good distance but not too strenuous. 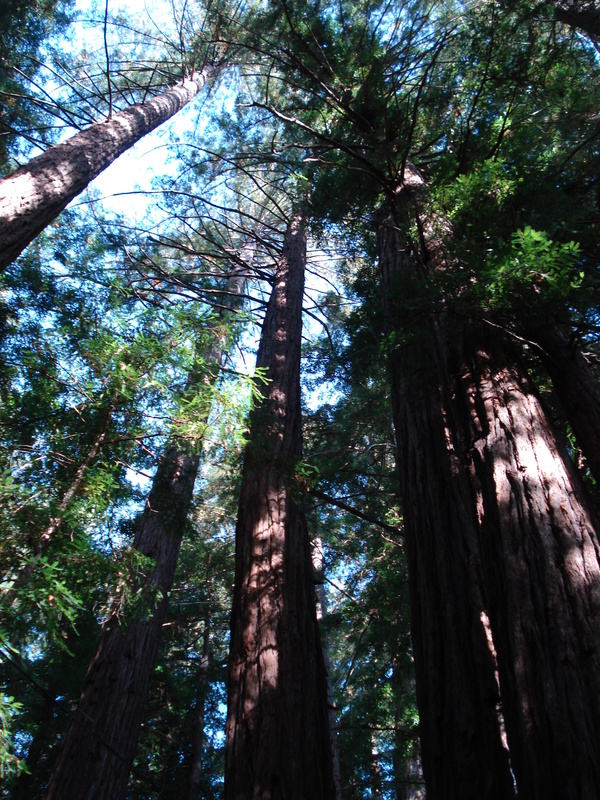 The Redwoods will never cease to impress me with their size…and these aren’t even the big ones! 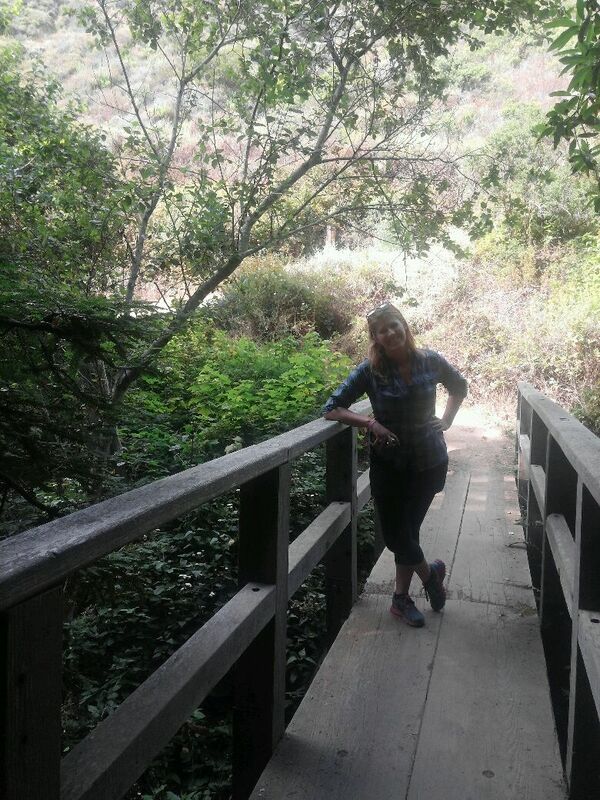 I love the lush scenery of Big Sur! Since we still had more on our itinerary for the day, we didn’t loiter at the waterfall and turned back around to head out. 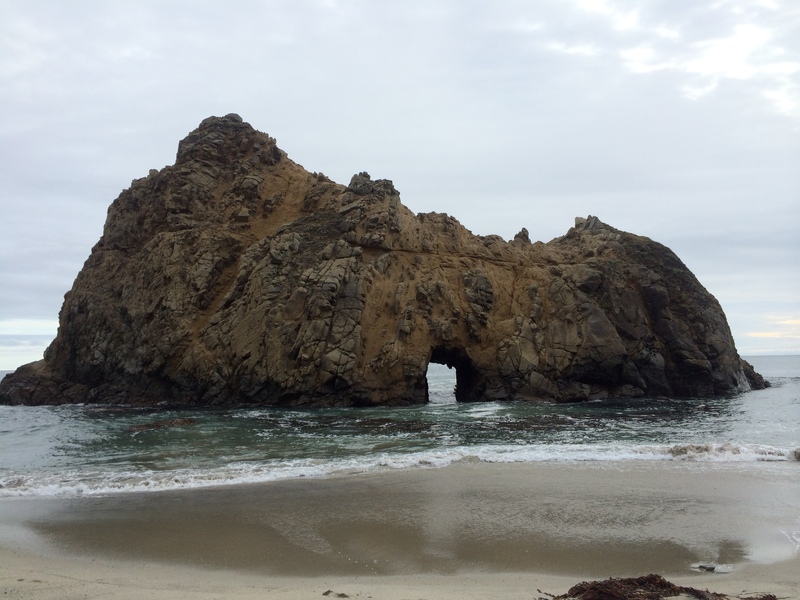 I would love to spend more time in Pfeiffer Big Sur State Park some day and explore the many other hikes, but due to our short time frame it was on to the next adventure; which was across the street at Pfeiffer State Beach to see it’s famous keyhole rock. This is another unmarked entrance that took us a couple of u-turns on Highway 1 to find. 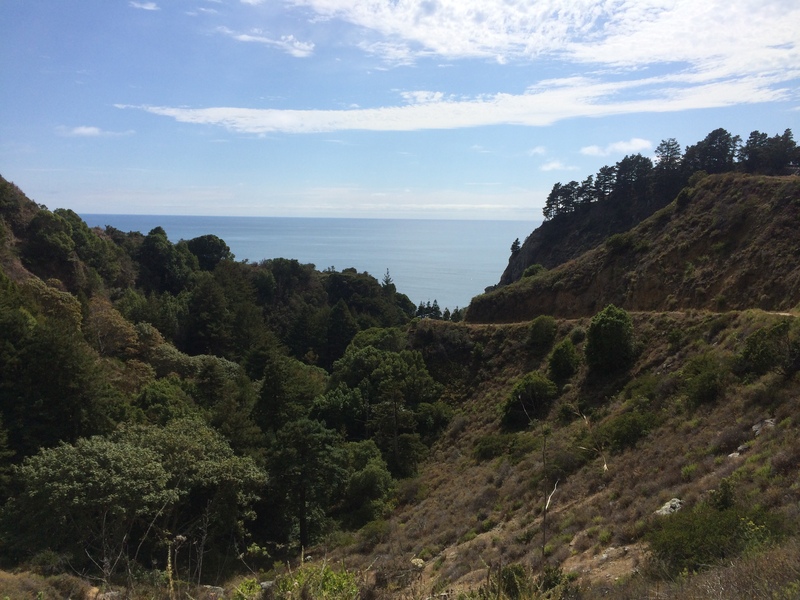 It is the second right headed south on Highway 1 leaving Pfeiffer Big Sur State Park and it looks like you are turning onto a residential street with several mail boxes at the start of the unmarked road. The street is named Sycamore Canyon Road but you will not find a street sign that says so fyi (hence our several u-turns). But you will quickly know you are on the correct street because a few feet after you turn you will see a big sign for Pfeiffer State Beach. 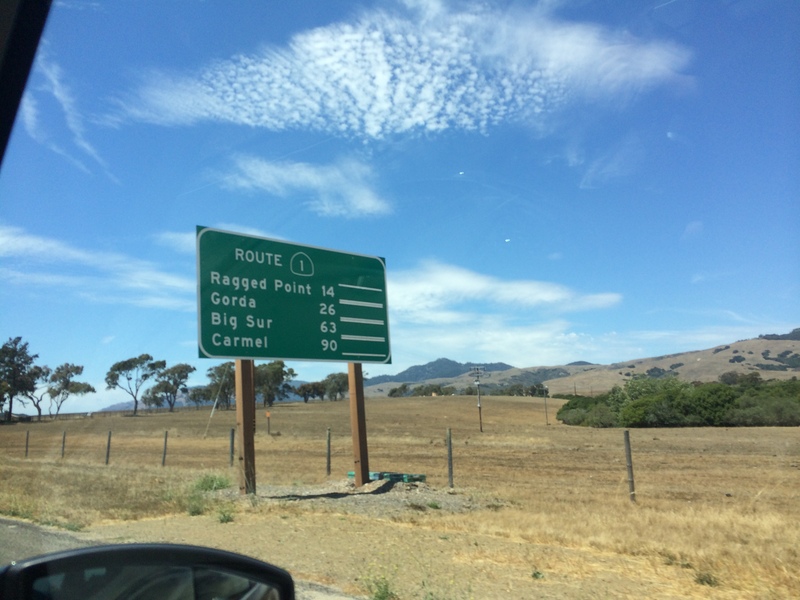 This sign is not at all visible from the highway. I wanted to watch the sunset here as it is supposed to be amazing, but it became overcast during our Pfeiffer Falls hike and remained that way while we were on the beach. 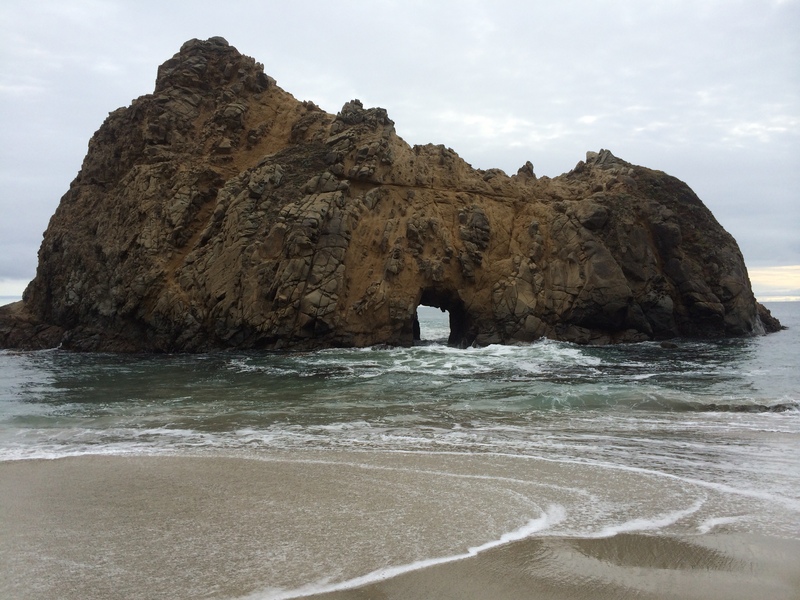 I did spend about 45 minutes walking the beach and watching the waves crash through the keyhole. At one point I was so entranced in watching the waves I didn’t realize the tide was up and a wave was coming right at me. I then had wet pants the rest of the day. Le sigh. 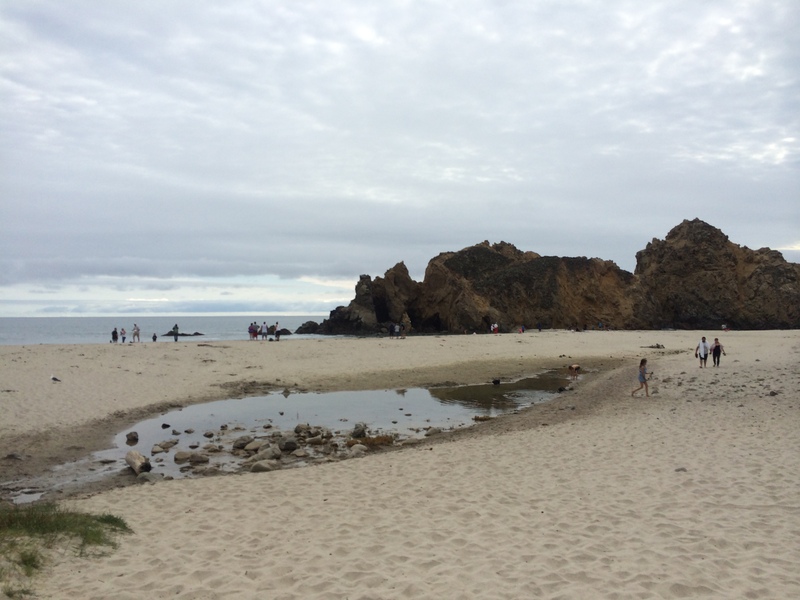 After a few attempts to find it we made it to Pfeiffer State Beach! A secondary keyhole rock, but this is not the famous one. 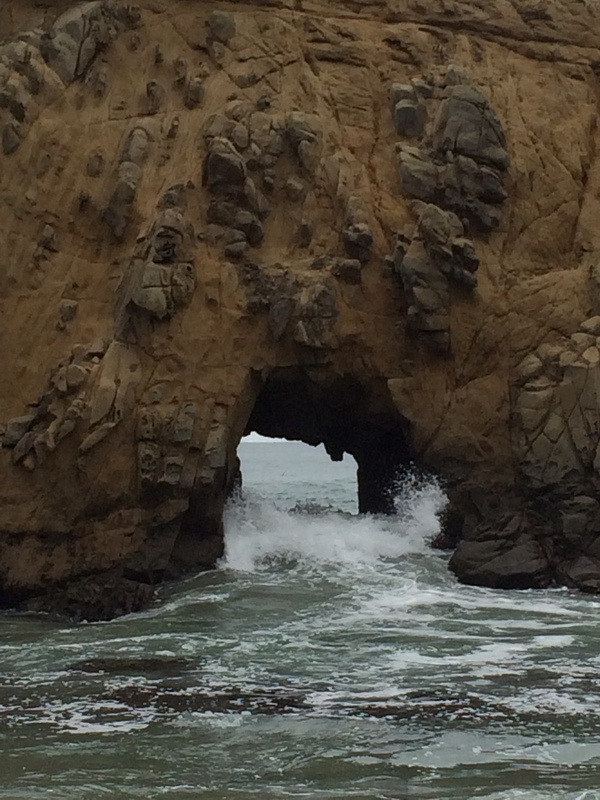 It was cool to watch the waves crash through the keyhole! Supposedly this beach has purple sand…I did not see any but I might not have been there at the right time of year or right time of day. Or maybe no one spilled grape Kool-Aid on the beach that day. 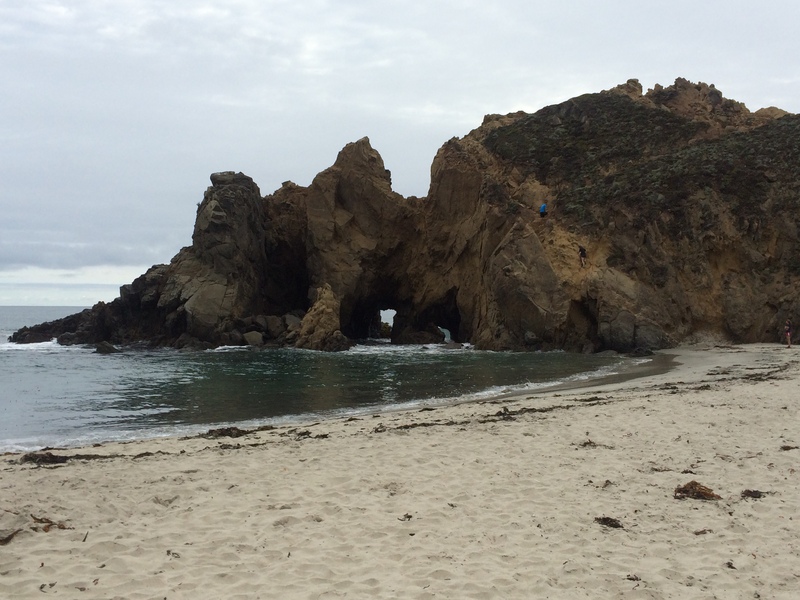 Pfeiffer State Beach is definitely a hidden gem as it is not easy to find but worth the struggle! This enclosed beach is a great spot to sit and enjoy the ocean, but not the best day for sunbathing! I wish I could have watched the sunset behind this rock, but I will just have to visit again! About 6:45pm we gave up waiting for the sun to come out and decided to head back to our shed. We were exhausted and hungry for dinner. I did go watch the sunset at our nearby cove which was incredible. The colors were amazing and sitting in the sand on a secluded beach was the perfect way to end our day of adventure in Big Sur. 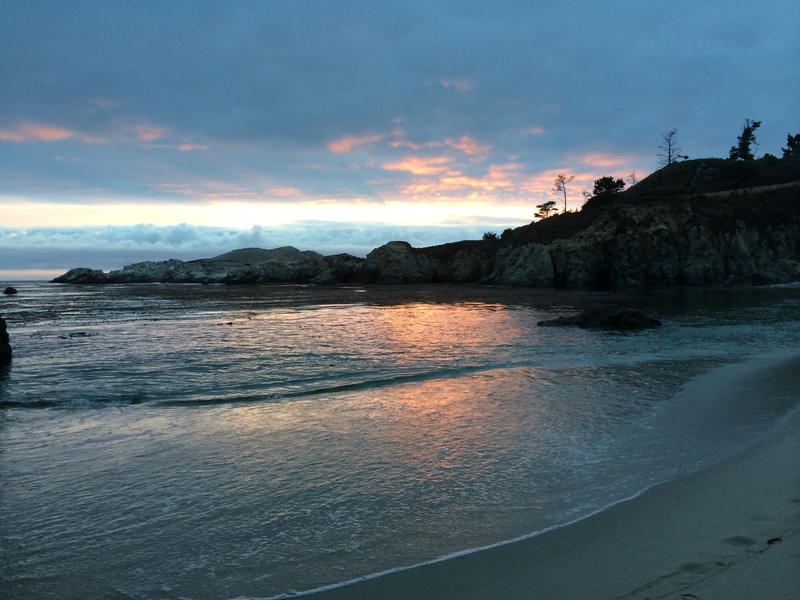 Luckily the sky was clearer farther up north at our private cove to watch the sunset! A last peak at the sunset before leaving for dinner. Then we headed to dinner at a yummy Mexican restaurant in Carmel Valley. We were craving carbs after our exhausting day so we googled nearby Mexican restaurant and that lead us to Baja Cantina for dinner. We first ordered sangrias and scarfed down yummy chips and salsa to satisfy our growling tummies. Our meals were great and the atmosphere was warm and we had a great time for our first meal out for the trip. 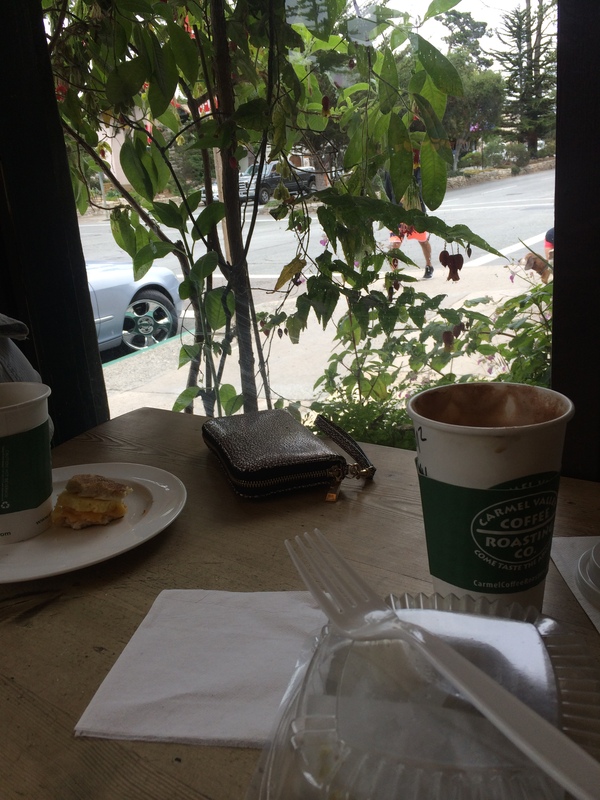 Enjoying a quiet breakfast in Carmel before hitting the road to Monterey! 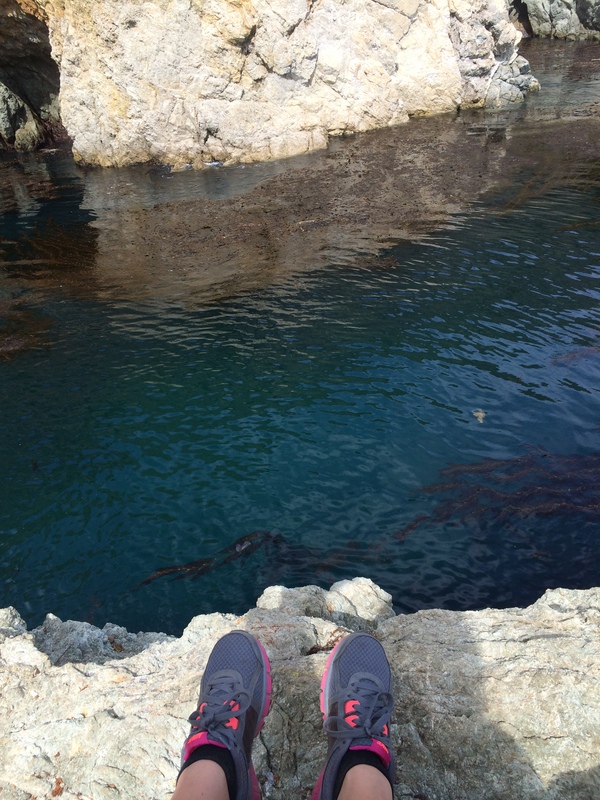 The only fun thing on our itinerary for Monday besides drive drive drive, was to do the 17-Mile Drive in Monterey. 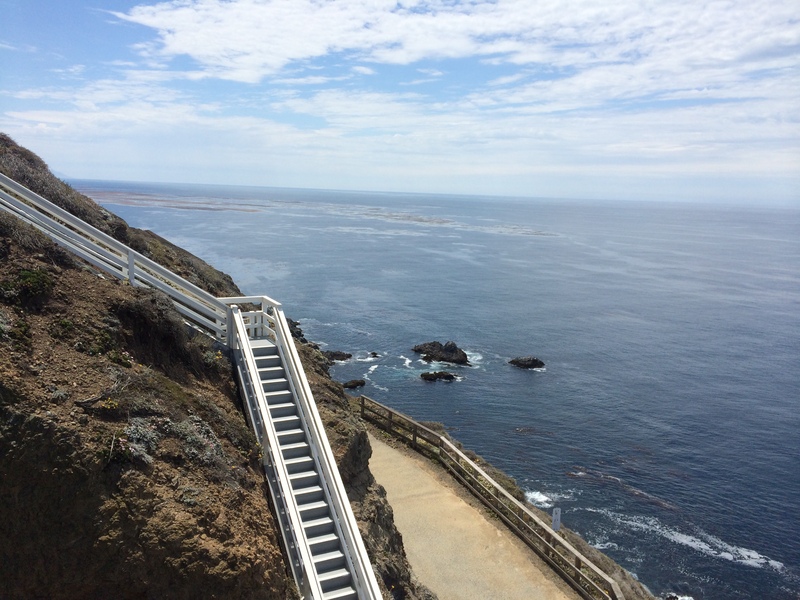 This scenic route winds through Pebble Beach and Pacific Grove on the Monterey Peninsula. The 17 -Mile Drive began as a tourist destination for the Hotel Del Monte in the 1890s, and it was originally offered as an excursion for the hotel guests to attract buyers to the residential plots on the land. 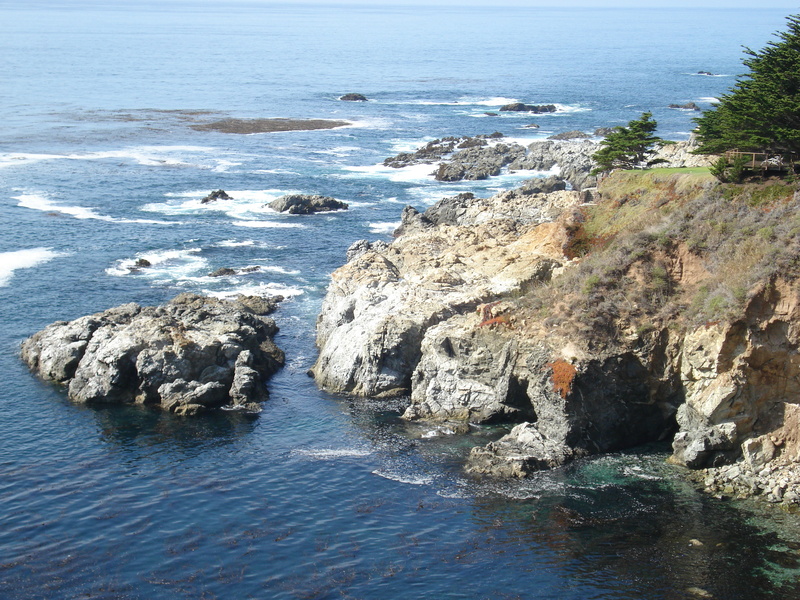 Today it is still a tourist destination offering views of the coast, golf courses, mansions, and unique features such as the “Witch Tree” landmark, the Lone Cypress, and the Ghost Tree. 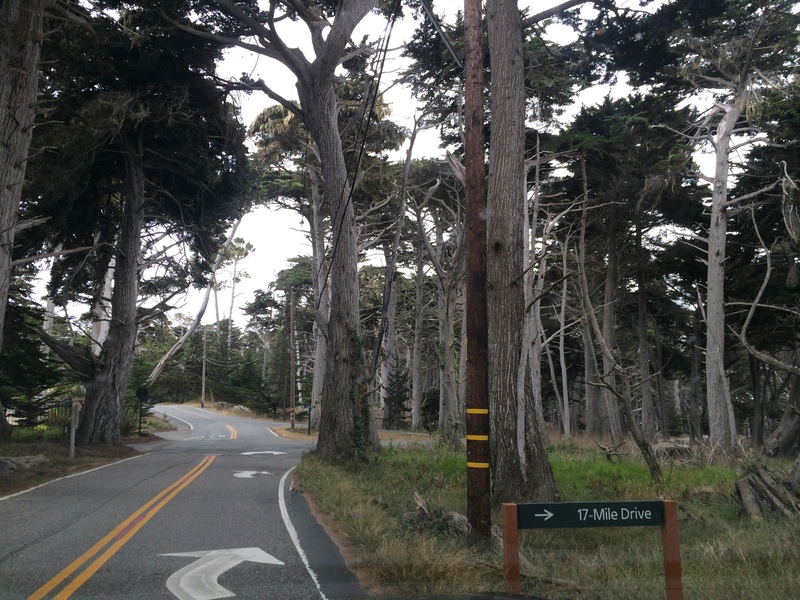 Winding along the 17-Mile Drive! We stopped at one of the beaches along the drive and took in the view. We decided to take The 101 back to LA, since The 1 takes twice as long. A beautiful, but time consuming drive. not to mention the car sickness. And that was our trip! 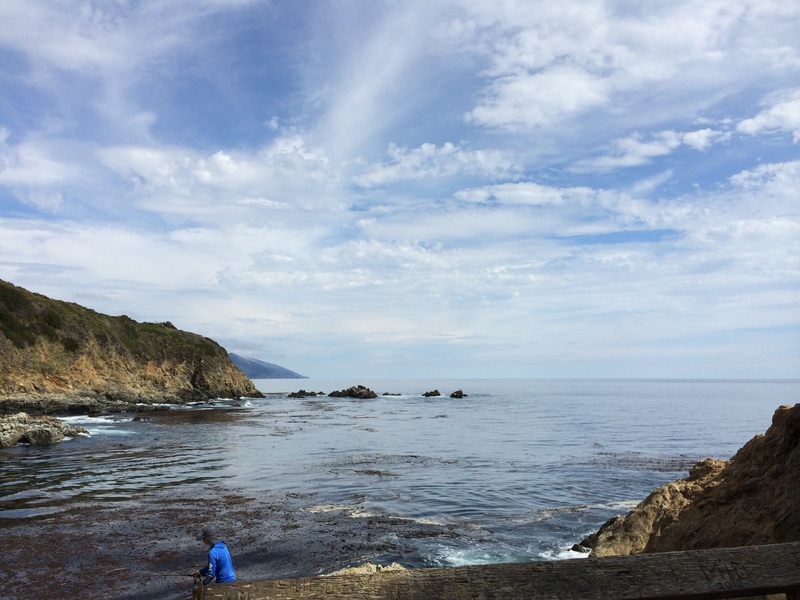 It flew by and we definitely could have used at least another day in Big Sur, but you live and learn right? We saw all of our musts and that was the most important! Maybe I will be back, maybe I won’t, but I sure hope I will be! It’s a beautiful area that deserves more time. 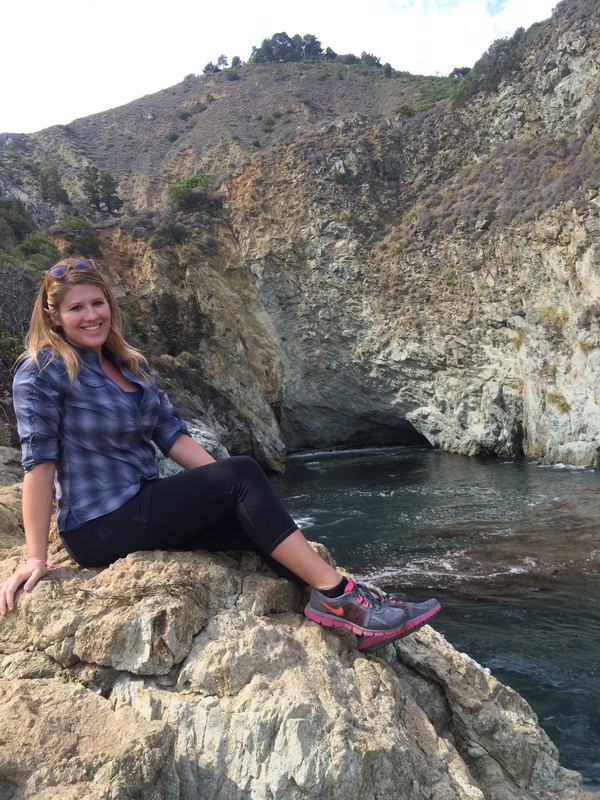 Everyone, add Big Sur to your travel must-list! The deep colors of the ocean and this rugged coast deserves a visit from everyone at least once in your life! You will not regret it! Plus the climate is nearly perfect year round! Let me tell you, we wore ourselves out on this trip! 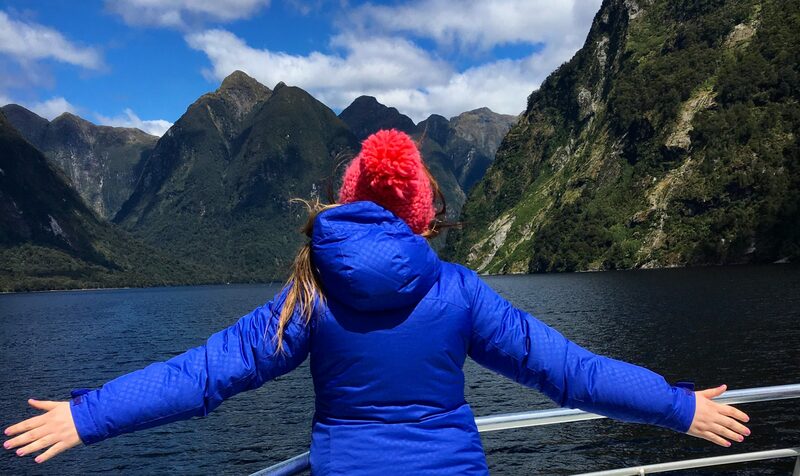 I am not quite the young spring chicken I once was and learned a lesson this trip that I either 1) need more time or 2) don’t fill my itinerary full to every minute.